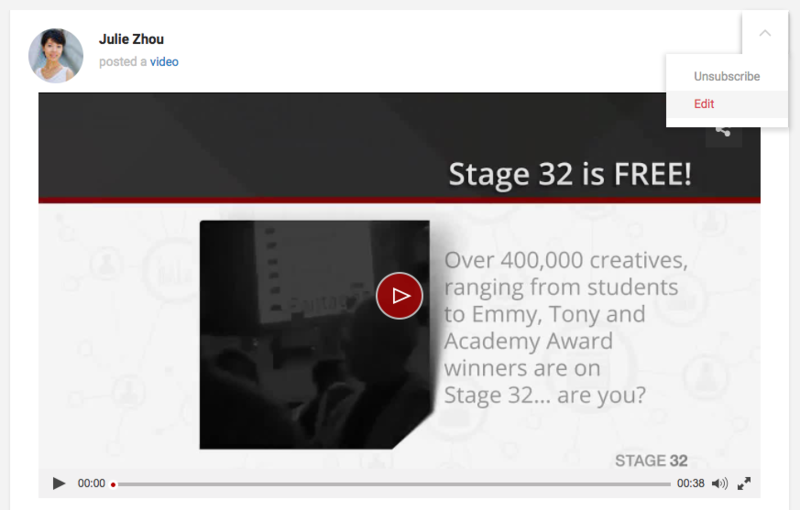 We've put together the top 10 steps you should take when getting started with Stage 32. Let's start with the first, one upload/updating your headshot & cover photo. 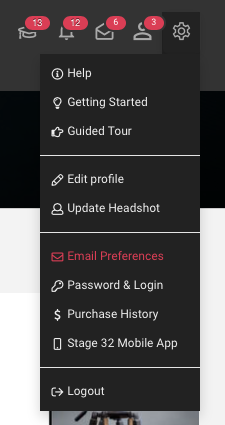 Click the Update headshot link under in the menu located in the upper right-hand corner of any page. 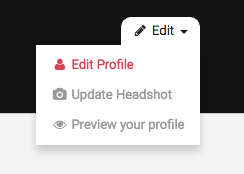 A new headshot update window will pop up allowing you to 1. drag and drop an image from a folder on your computer, 2. browse for a file on your computer, or 3. take a picture with your webcam, paste a link to your headshot from somewhere else on the web, or grab an image from your Facebook, Instagram, or Flickr account. After you select, an image, just wait for the upload to complete and for the headshot update window to automatically close. You will be presented with multiple options of editing your photo such as modifying orientation, cropping, removing red eyes and adjusting brightness, contrast, saturation and brightness. Once you are happy with your changes click "Save"
Your new headshot will be updated immediately. Updating your headshot is fun! Give it a shot now! Your Home page now has a completely different look. Similar to Facebook, on the Home page feed you’ll see all the activity from everyone in your network delivered in sleek, easy to read panels. You will notice that you have 4 options at the top: Post to Wall, Post to Lounge, Upload a Photo, Upload a Video – Let’s cover those briefly. Post to Wall – A post to your wall is only seen by the people in your network .We’ve now made it incredibly easy to add a photo or a video to a wall post simply by clicking on the appropriate icon below the text box. 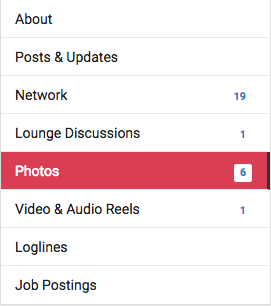 Post to Lounge – A post to the Lounge is seen by potentially everyone on Stage 32.Those who subscribe to that Lounge topic or are in your network will automatically receive the post in their Home page feed. Upload a Photo – We highly recommend sharing your headshots, on set candids or any other photos you’d like.You can caption and receive comments on your photos as well. Upload a Video – We also highly recommend sharing videos on your wall.Again, you can caption and receive comments as well. The profile page has been updated to make it easier than ever to post all your pertinent information about yourself. Here is your place on Stage 32 to be social in a professional networking environment. This isn’t a place for pictures of cats, food or babies – this is a place for asking questions, posting valuable content and discussing your craft, the business and general discussions of film, TV and theater. Want to know how some creatives have climbed to the top of the mountain? We have over 1500 entries on the Stage 32 blog that follow the journeys of some of our members – directing to producing, acting to crew and everything in between – as well as other informational and educational posts. This is a great place to find advice, tips and support from the Stage 32 team and other members who range from film students to Academy Award Winners. 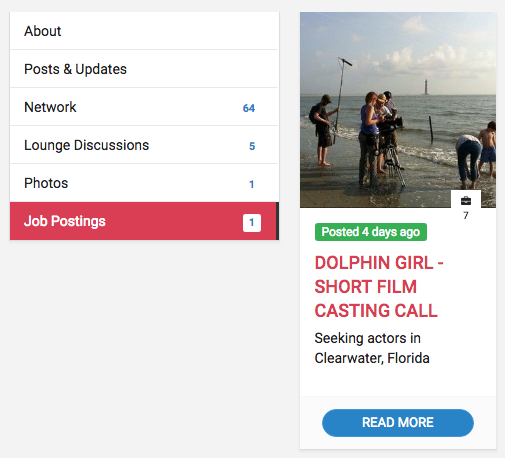 Need to hire cast and crew? Looking for work? This is the place to go. 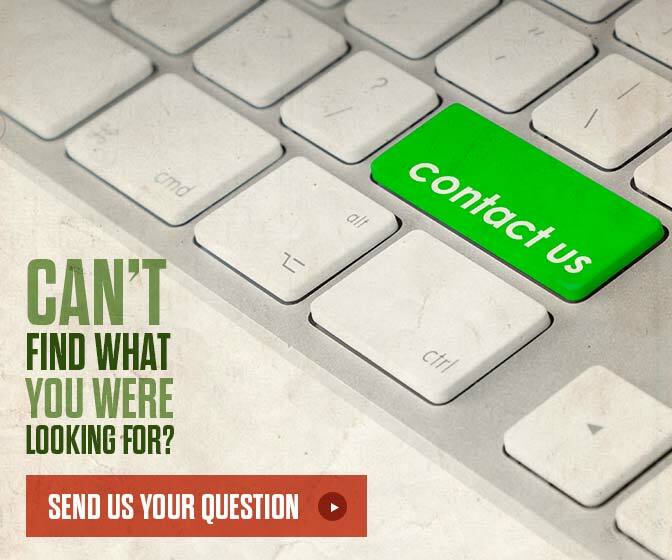 We offer detailed search options for occupation, location, compensation and more! Stage 32 has been recognized by Forbes Magazine as being the leader in Online Education for those working in film, television and theater. Whether you’re looking to learn a new craft or improve your skills, you’re in the right place.We only work with top industry and trained professionals to teach our Next Level webinars, classes and labs which are available both live and On Demand. 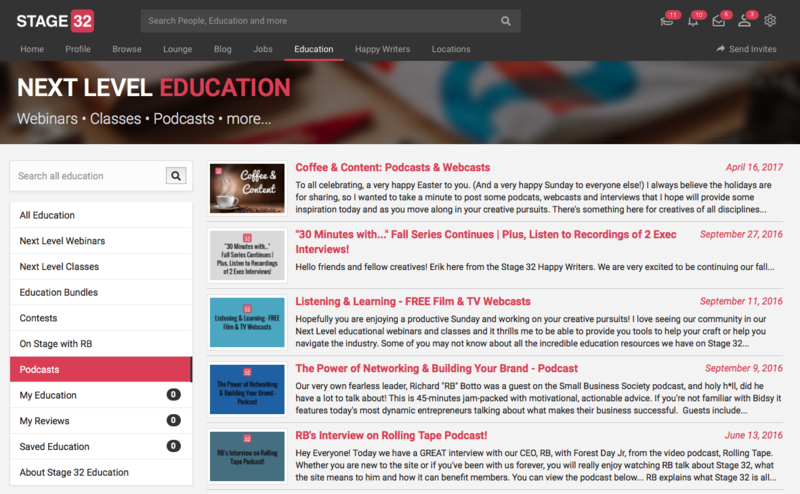 Also under Education, you’ll find my free On Stage With RB webinars as well as other free podcasts and webcasts. We work with over 500 industry development executives, managers and agents worldwide to help develop our writers through our in-depth services for our screenwriters. We have helped over 200 of our writers get optioned, in development, sold or placed to write on film or TV shows.Whether you’re ready to pitch your screenplay or receive studio coverage from an executive of your choosing, we break down the barriers to help you toward reaching your dreams. Your profile is your most important page on the site. Similar to LinkedIn (after all, we’ve been called “LinkedIn for creatives”), it is important that you have a fully completed profile before you start networking! You can access your profile from your top menu bar. Fact: We polled members who have hired Stage 32 members for their projects and 91% of them said a completed profile was the most important reason they did. Think of it this way – would you show up to an interview without your business cards, reel or headshots? This is your first impression to the Stage 32 community. Make sure you upload your photo and a cover photo so we can instantly get a sense of your personality! personally involved in, all in one easy place for you to find! Similar to IMDB, here is where you make yourself shine. You can fill out your bio, location, Resume/CV, Education, Credits, Awards and links. Remember, be thorough!You only get one shot at a first impression! Similar to friends on Facebook, or connections on LinkedIn, this shows the Stage 32 members that you have accepted into your network. You can search by name, location or occupation to narrow your view. Here you can easily keep track of all the lounge discussions you are involved in all in one place at-a-glance! This is where you upload headshots, on-set photos, photos of your work, inspirational photos, photos of equipment you use and more! Fact: When polled, 91% of Stage 32 members who have hired cast or crew for a project have disqualified a candidate if they do not have headshots, stills (or other photos of their work) or a reel (or other pertinent media) posted to their profile. You’re here to network and make meaningful connections, so make sure you round out your profile by uploading your media – your reel, your short, your feature, your voice reel, your composer files, or whatever is pertinent to your craft!Regardless of whether you have a personal website or have your media posted elsewhere, be sure to upload it to your profile as well! Fact: When polled, if people have to click out of Stage 32 in order to see samples of your work they are 83% more likely to click away from your profile on Stage 32. Have a great script? 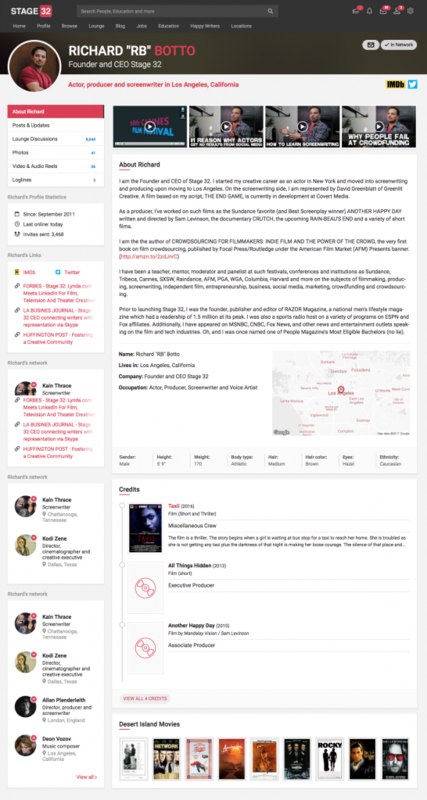 Upload your screenplay title, loglines and full screenplays in this part of your profile. 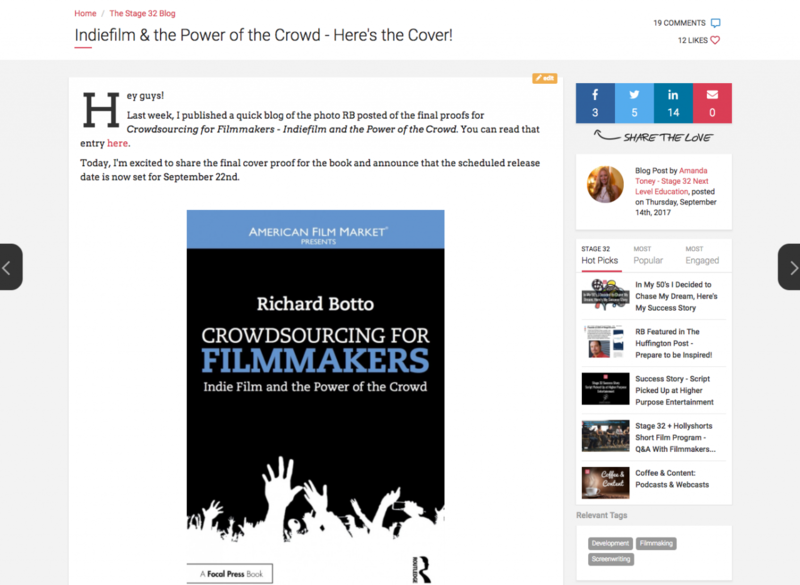 Are you casting or crewing a film? Here is where you can keep track of all the submissions you receive for your job postings. Under SETTINGS, click EDIT PROFILE. 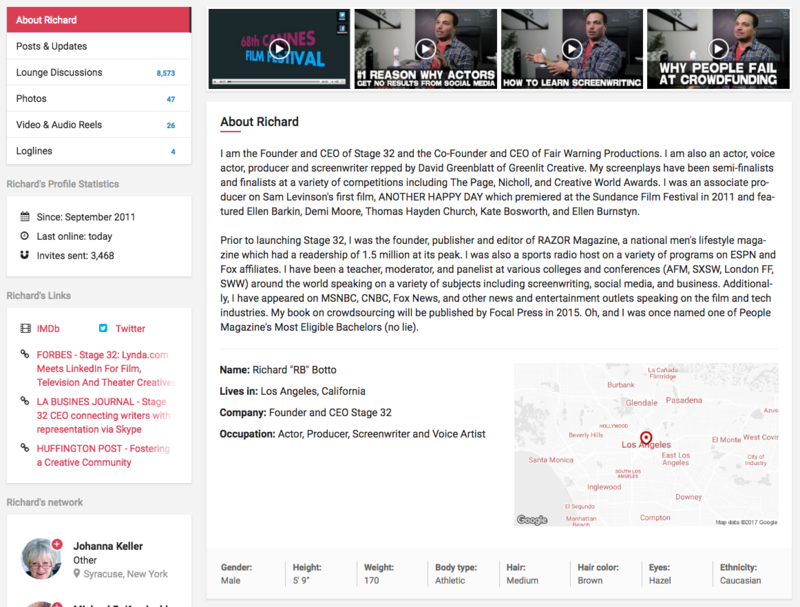 After you've uploaded your headshot and cover photo, filled out your complete profile and learned how to navigate your top menu bar, now, it's time to Introduce Yourself to the community!There are over 500,000 film, television and theater creatives in the Stage 32 community and you will find this community incredibly supportive. To introduce yourself, click on the "Lounge" on you top menu bar, then click on the "Introduce Yourself" lounge. 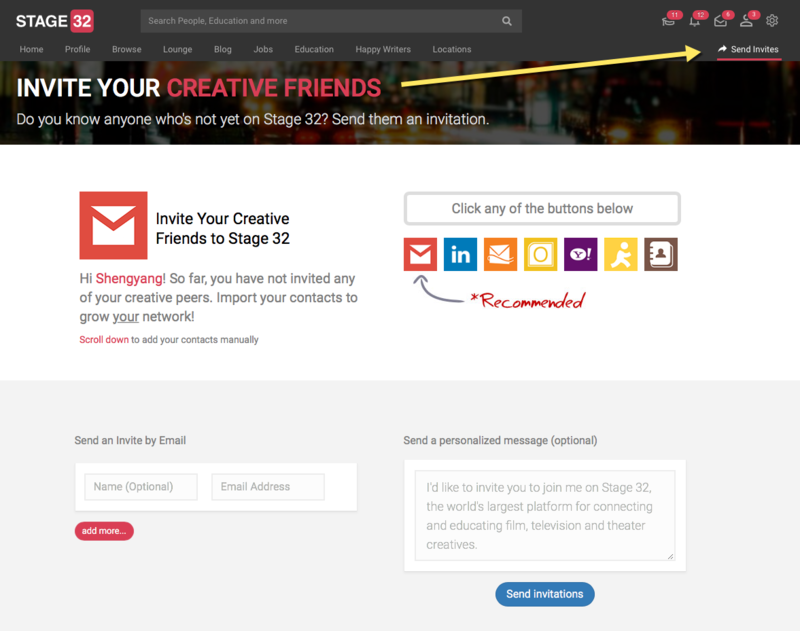 In here, take a moment to let us know more about you as a creative so the Stage 32 community knows who you are! With hundreds of thousands of creatives all over the world in the Stage 32 community, take some time to shine and introduce yourself! Expanding your Stage 32 network is easy. 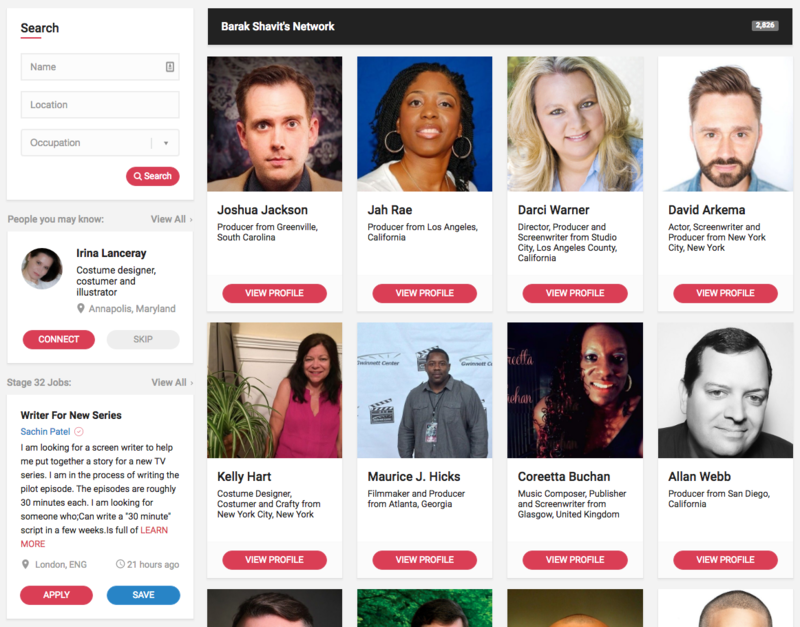 You can find and connect with Stage 32 members who are near you, are looking for creatives with your skillset in your area, or are connected with people already in your Stage 32 network. 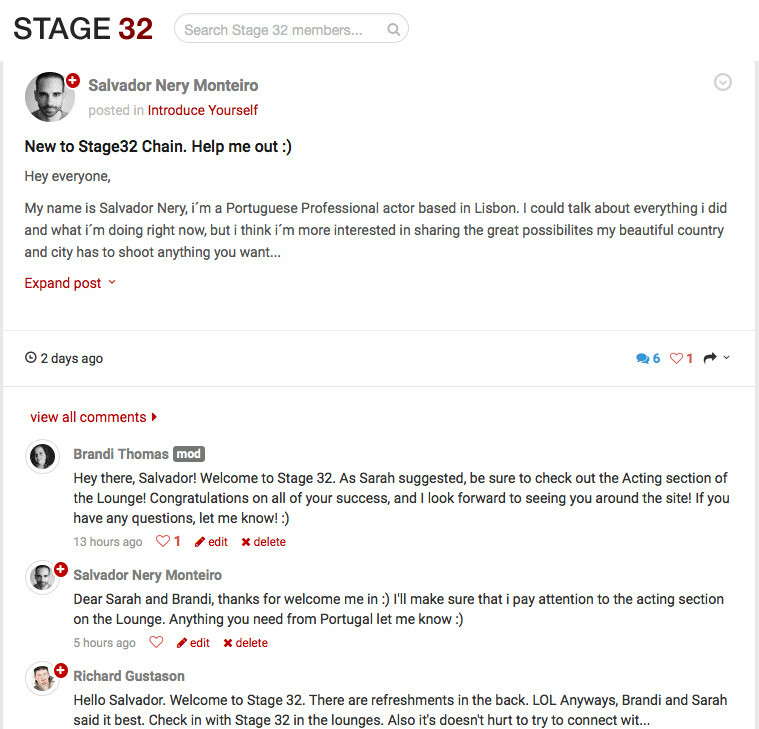 Remember this is a professional social network and we highly recommend that you have a fully completed profile before you start networking on Stage 32. 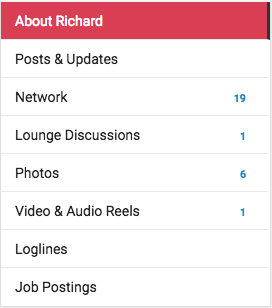 To start building your network, from your top menu bar, hover "Browse", then select Members Here you can connect with all Stage 32 creatives by "Search all Members", "All Network Suggestions", "Friends of Friends, or "Random". You can search any of these categories by member's Name, Location or Occupation. To add a member simply click the "+" button next to the creative you'd like to connect with. You will also find these buttons on your wall, in the lounge and other various places on the website. Just click the button and the other member will automatically receive your request. Click on "Profile" on your top menu bar, then click "Network"
(1) "Search" - You can search for any members you have in your network by Name, Location or Occupation. (2) "Your Network" - You can search the members who you have chosen to network with. (3) "Expand Your Network" - When you click the view all button you will get a list of new members to consider adding to your network. Expanding your Stage 32 network is a great way to find work in your area and connect with other like-minded creatives. Get started today! Making a wall or lounge post on Stage 32 is easy. You can access this from your home screen. Wall Post - if you make a wall post will be seen by everyone in your network. Click "Home", Click "Post to Wall", start typing. You can upload Photos or Video underneath the box you are typing in. Click "Post" and your post will be seen by everyone in your network. Click "Home", Click "Post to Lounge", start typing. You can upload Photos or Video underneath the box you are typing in. Click "Post" and your post will be seen by everyone in your network. 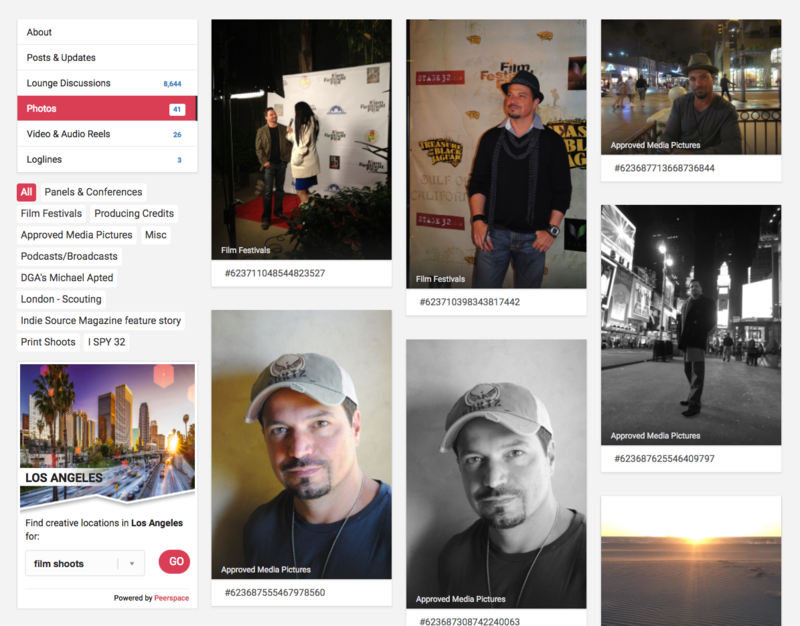 You can upload headshots, on-set photos, photos of your work by clicking "Upload a Photo" on your Wall Post box. You can upload videos, reels, shorts, voice clips and any other media by clicking "Upload a Video" on your Wall Post box. The Stage 32 lounge has over 120,000 discussions about the business & craft of film, television and theater, as well as industry discussions and it even showcases our members work! Head over there to get involved in the conversation! Since day one, Stage 32 has been a professional community that has been crowdsourced and grown by word of mouth. We ask that you please invite at least 5 of our fellow creatives to expand and strengthen our community. Please help strengthen our community. Happy Networking! See you on Stage 32! Forbes has recognized Stage 32 as the world leaders in online education for film, television and theater creatives. Take a minute to check out our live and on-demand Next Level webinars, classes, and labs. Looking for work? Need to hire cast and crew for your project? Browse jobs in your area or post a job for FREE! 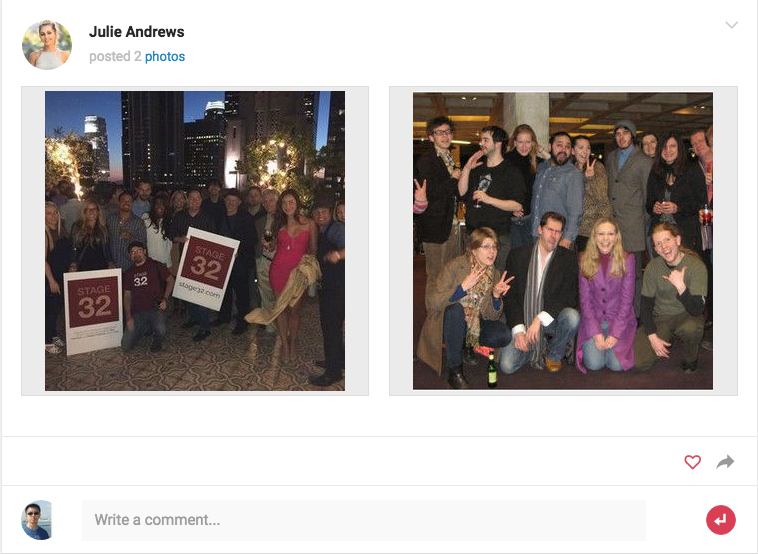 Thousands of Stage 32 Meetups have happened all over the world. See if there is one in your area or start one today to take your networking offline. Are you a screenwriter? 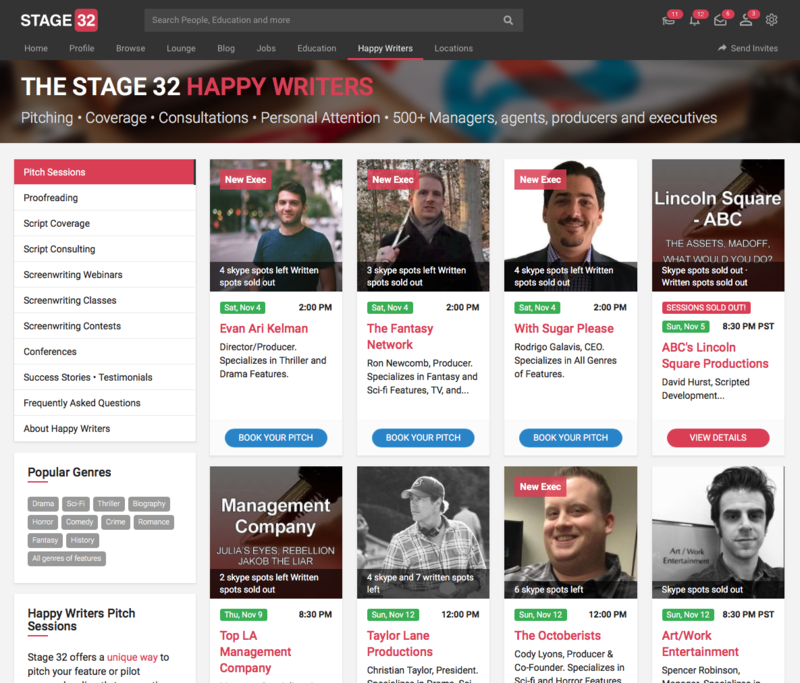 Don't miss the Stage 32 Script Services highly acclaimed pitch sessions, contests, coverage, classes, and labs. You will then see the popout as on the screenshot below. Fill in your information and Save changes when done. Keep in mind that you can list multiple occupations. Simply start typing and a list of all available occupations will give you additional options. You can also drag the occupation boxes to reorganize and select your primary occupations. Are companies allowed on Stage 32? Yes, however we require that you associate a name with the company, such as - John Doe - Planet X Productions. Many Stage 32 members are reluctant to accept network requests from profiles that do not have a proper name attached and will mark the sender as spam, which in turn will cause the account to be blocked. Can I choose more than one profession? Yes! We accept all multihyphenates! If you are an actor who also directs or a producer that also writes, you have the ability to choose more than one profession. Go to your profile, click on the "About" tab, then click "Edit" link within your "Background" section as demonstrated below. You will have an option to edit your profession and make any applicable selections. Yes! A network is only as strong as its members. That's why we ask all new members to invite 5 fellow creatives. You can do this right through the site by using the Invite friends to Stage 32 section directly below your profile picture. We also ask our members to spread the word through other social media such as Facebook, Linkedin, and Twitter. To change your email notification settings, click "Email Preferences" link in the settings or in the footer. Here you can choose what types of notifications you'd like to receive. Note that there are multiple options as some members would like to receive specific types of notifications and not receive others. For instance, you may want to receive a notification each time somebody sends you a message, but not receive any notifications about people posting on your wall. 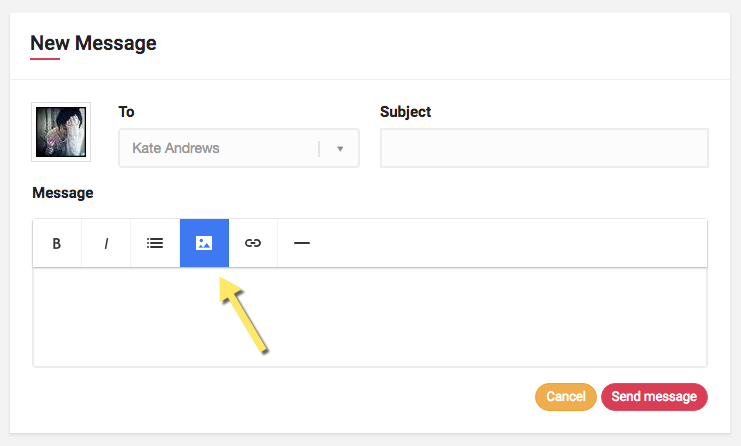 When done click "Save"
Note: keep in mind that some emails might be loaded ahead of time, which means you might still received a message or two after you unsubscribe, so please allow up to 2 days for the emails to stop. In an unusual situation where this does not work, feel free to send us a message. How can I format text and add links? 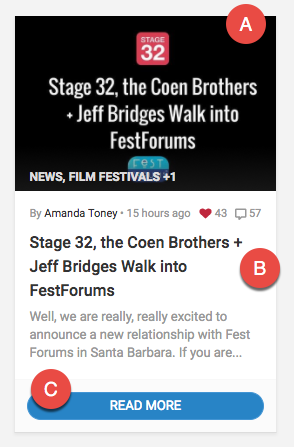 You can add special formatting and custom links to Lounge posts, wall posts, and messages on Stage 32. How do I "talk" with another Stage 32 member? There are several ways to communicate with another member of Stage 32. You can post on another member's wall, which is open for all members to see. 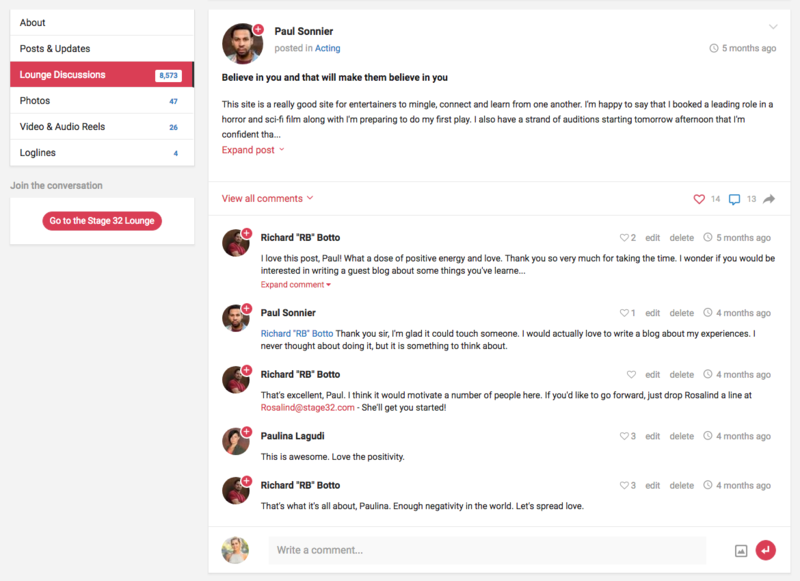 You can start a discussion or participate in an existing conversation on the Post discussions. 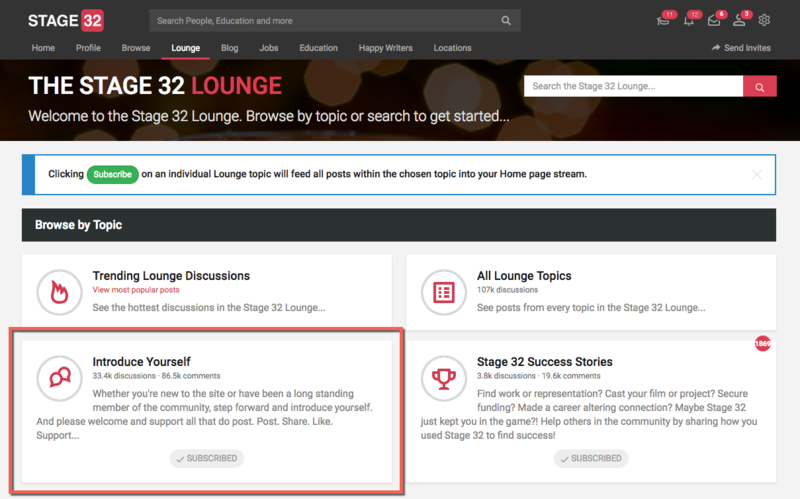 You can post a topic or reply to a post in the Stage 32 Lounge. You can send them a private message by clicking the envelope icon located on the top menu. You can click the 'Chat Now' on the bottom of the page to start an instant private chat session. 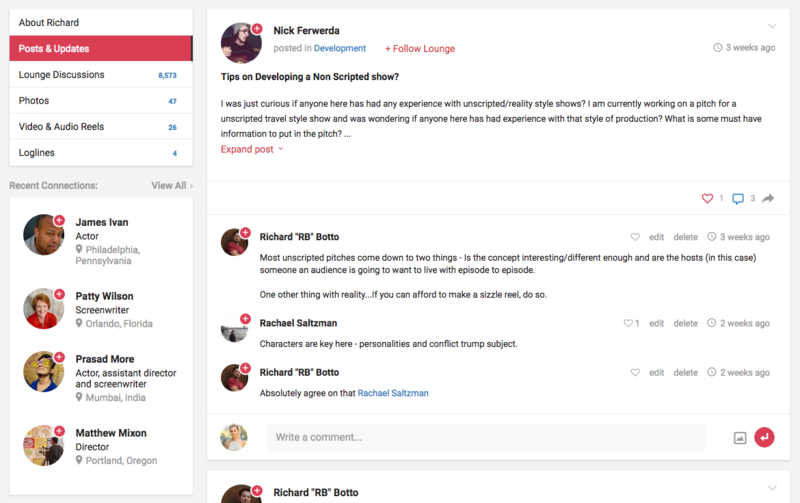 Explore the site, find people and topics that interest you and then NETWORK! How do I ask someone to join My Network? Once you find someone you'd like to add to your network, click on the add icon next to his username. Alternatively, you can find people suggested under "People near you," "Expand your network," or "People you may know," in which case there will be a small "Add" button next to their profile picture. We're sorry to see you go. To close your account, you may click on "Password & Login" in the settings or in the footer. The delete account link is on the bottom right. How do I link directly to a Lounge or wall post? Click the blue arrow icon under any Lounge or wall post (directly above the comment section). This will open a popup with the page's URL. Just copy the URL from your browser's address bar and paste it in an email or share it with friends via Facebook, Twitter, or other social networks. How do I update my location information? How do I use the "Search" function? You can use the quick Search bar in the top menu. 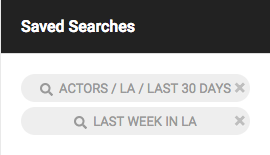 For more advanced searches, under Browse, select Members, Videos, Loglines, Jobs or Meetups. How many private messages can I store and how long do they stay stored? Currently, we have no limit on the number of private messages a member can store. As long as your account is active, all private messages will be stored until the recipient deletes them. I Hate My Face - Do I Need To Upload a Headshot? Don't be shy! 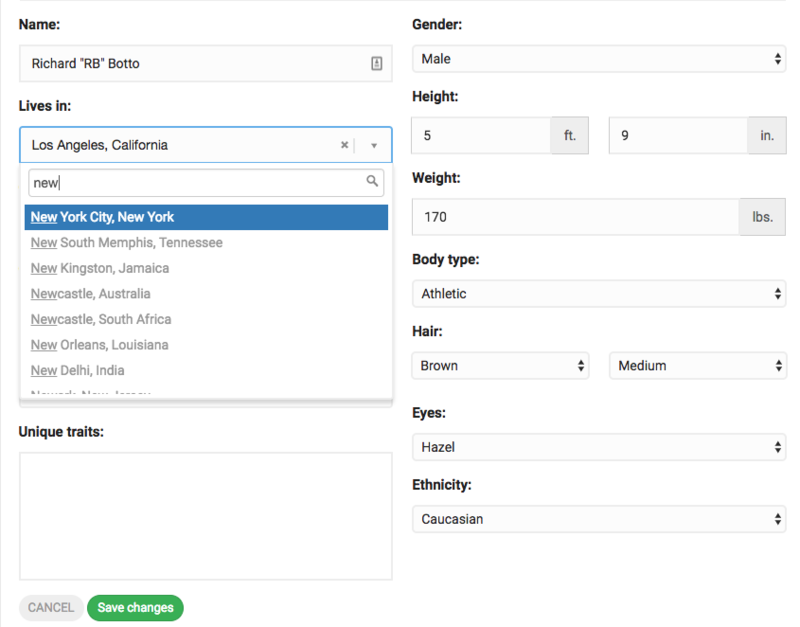 Profiles without a headshot will have limited access to the site, not be featured in certain sections ("People Near You", for example), and will rank lower in search results. Also, many Stage 32 members are reluctant to accept a network request or communicate with those who do not post a headshot. Simply put, adding a profile picture will allow you to experience everything Stage 32 has to offer. Put a face to the name! I have a personal website - Can I link to Stage 32? Yes! And we encourage you to do so. Many of our members have had great success in directing interested parties from their personal website to their Stage 32 profile. I just joined Stage 32 - where do I start? Our Founder and CEO, RB, did a FREE webinar that goes over all of the site features. This "tutorial" is about 20 minutes, followed by a 2 hour Q&A session about how to best use the site, as well as questions about the industry. You can access the FREE video here. I still have a technical question. Who can I contact? Please review the FAQ one last time. If you are still having technical difficulties, please contact our Technical Support Team. Is there a Stage 32 App? What is Build My Network? There are two ways to build your network and expand your area of influence on Stage 32. Remember, who you know is as important as what you know, so start reaching out to as many people in the industry as possible. Expand your network -- Will list individuals who have projects that may be of interest to you. Check out their projects in progress and see if there is a good fit. For example, a director may be looking for actors/actresses, a playwright may be looking for a producer, or a producer may be looking for a director. People you may know -- This is a list of individuals who have something in common with you -- whether a mutual friend or contact, film school attended, or city that you live in. What is Stage 32's policy on self-promotion and SPAM? We have a zero tolerance for spam at Stage 32. And while we realize that all of our members have something to promote - a company, a crowdfunding project, their reel or loglines - we ask that they do so in an organic way. Sending canned private messages to multiple accounts. Soliciting payment for a product or service via wall posts, Lounge posts, private message, project posting, etc. Violation of any of these spam policies will result in an automatic account suspension and removal of the offending content. We ask all of our members to be active in the community, to participate in conversations and offer assistance and guidance to other members where possible. We believe that attention to one's brand and work begins with a selfless approach to networking, not through spamming. 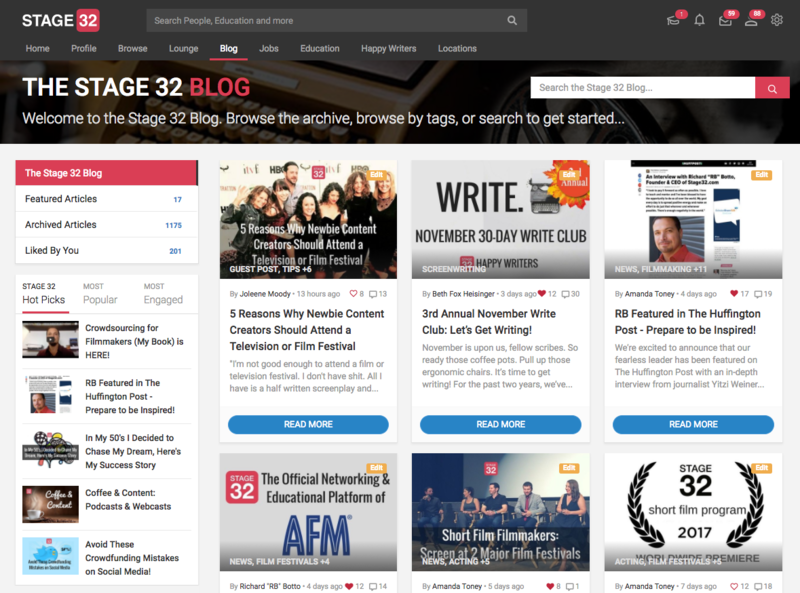 Stage 32 is the world's largest social network and educational site for film, television and theater creatives. Launched in September of 2011, the community is now filled with over half million members from every country on the planet. Simply put, Stage 32 is the online community uniquely populated by the most creative people on Earth. For more on Stage 32, please read our mission statement. What is the difference between a Wall Post and a Lounge Post? When you post on your wall without a Lounge topic, your post is ONLY visible to those in your network. This is a great way to communicate directly with those in your inner circle. When you post with a Lounge Topic attached, you are posting to EVERYONE who subscribes to the topic, wanders into the topic, and those already in your network. What Professions Are Permitted on Stage 32? Stage 32 is a community for film, television, and theater creatives. If you work in any of these fields - be it as a actor, producer, director, writer, composer, crew, etc - you are invited to join. If by chance you feel your profession is missing from our comprehensive list, please feel free to drop us a line. 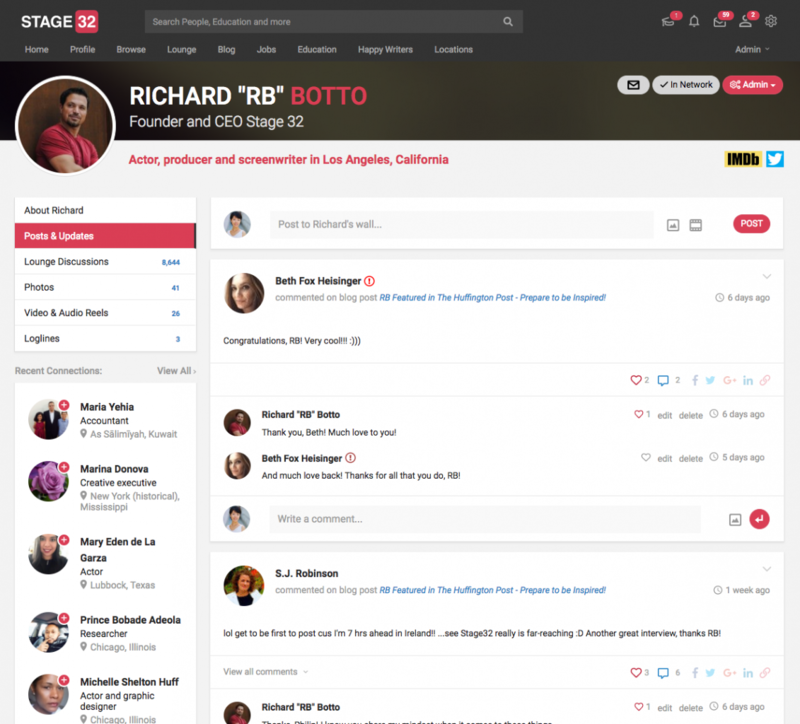 Stage 32 is the brainchild of Richard Botto (CEO). A creative himself, Botto knows first-hand the challenges all creatives face finding work or attracting attention to their projects. He believes that networking is equally important as perfecting one's craft. Their intent with 32 is to make networking easier and to make the world a little smaller. Who do I contact with a press inquiry? Who should I contact for marketing, strategic partnerships, or sponsorships? When you post to your wall, your post will only be seen by members in your network or people viewing your wall directly. This is a great way to communicate directly with those in your inner circle. When you make a Lounge post, you are posting to everyone who visits the Lounge, subscribes to the topic you post in, wanders into the topic, and also members already in your network. Posting in the Stage 32 Lounge is a great way to reach out to a much larger portion of the Stage 32 community and grow your network. Enter in your new password in the PASSWORD and CONFIRM PASSWORD fields and click SAVE at the bottom of the page. Your promo code usually relates to a class or a webinar discount - to learn more about classes and webinars go to Next Level Education's about page. On every webinar and class page you will find a input field that states "Enter your promo code" - enter the code then choose your payment option to continue to checkout. You will instantly see that the code has been applied. How do I scroll through blog posts? Once inside the blog post you will notice pagination arrows to each side of the post. This will allow you to quickly browse through your search results. What is the Stage 32 Lounge? The Stage 32 Lounge is the coolest hangout on the web. 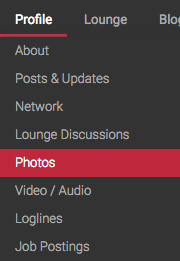 You can add a lounge topic to any post - there is a drop down menu beneath every posting bar - or you can just enter the Lounge (top menu button) and join any conversation in any topic. 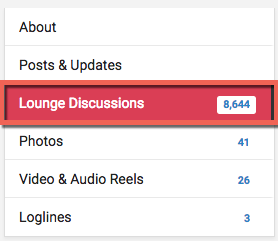 Further, you can subscribe to Lounge topics or simply just follow a Lounge discussion. The Introduce Yourself section is a great place to quickly make yourself available to the entire network. How do I view the blog post? To access the blog post you can click on the image of the blog post (A), the title (B), or the “Read more” button (C). Removing comments couldn't be easier, but in case you've missed it, there are "edit" and "delete" links next to each comment you post. Click "delete" link and continue with confirmation to remove each comment. Note that anyone subscribed to the lounge post might still remove the email with the body of the comment, so comment responsibly. Do you need to remove a post that you've made in a lounge? No matter what the reason for that is, you can do so by clicking the chevron in the upper right corner to open a dropdown list. Then select "Delete". How do I search the blog? 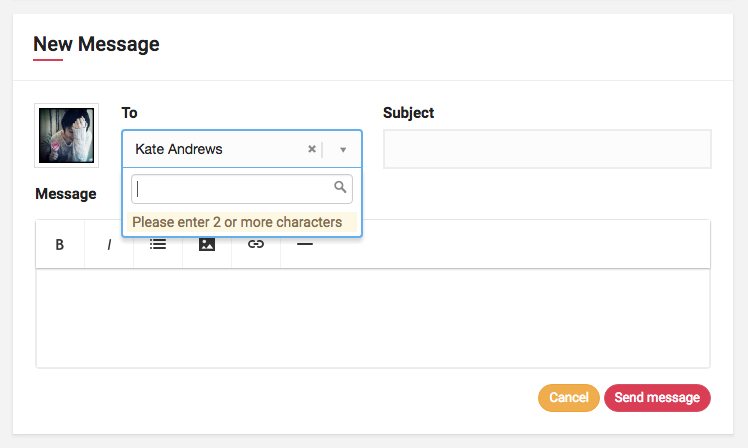 Searching for blog posts is now easier than ever – you can use the field in the heading to search for any particular keywords, or click on any specific tags to see the blog posts only within that category. Liking is the best way to show your support to fellow Stage 32 creatives. Here's how to enhance your network standing and gain Karma Points by liking posts, photos, videos, loglines, Lounge discussions and much more. You'll see a Like link next to each wall post, Lounge discussion, comment, reel video, logline & screenplay, project, and photo. Just click heart to show support. When you've liked an item, the heart link will turn solid red. A number next to the like link will show you how many members have liked that item. Just click the number to see a list of those members. Show your support by liking wall posts, Lounge discussions, comments, videos, loglines & screenplays, projects, and photos. Support a fellow creative today! What are blog tags and how do I use them? Blog tags indicate categories for all of our blog posts. If you are interested in reading all of the blogs marked with the tag "Producing" you can click on the "Producing" tab and you will be shown all of the blog posts that belong to this category. Clicking on the comment icon will take you directly to the comments section. Clicking on any of the tags on the page will execute a search and show only the blog posts matching the specific tag. And as always, you can support the author by liking the blog post right below the tags. What are the headshot dimensions? As far as the headshot goes, we strongly recommend uploading a square image 500px in width or bigger. If the image is not a square, don't worry, you will have an option to crop it to ensure that other see your face instead of just seeing your forehead. Where can I find the schedule for the next "On Stage with RB" session? Stage 32 Founder and CEO, RB, hosts a live webinar once a month, however there is no set schedule for when it will happen next. Stay tuned and we will notify you via the newsletter and, as always, you can see the upcoming events including On Stage with RB on the top of your home page. And don't forget - you can always rewatch any of the sessions you previously missed on the On Stage with RB page located under the "Education" section in the main menu. How do I Search for People on Stage 32? Just click "Search" when you are done, and you will get a new list of all the members matching your search criteria. Can I set my network request notification preferences? Yes. 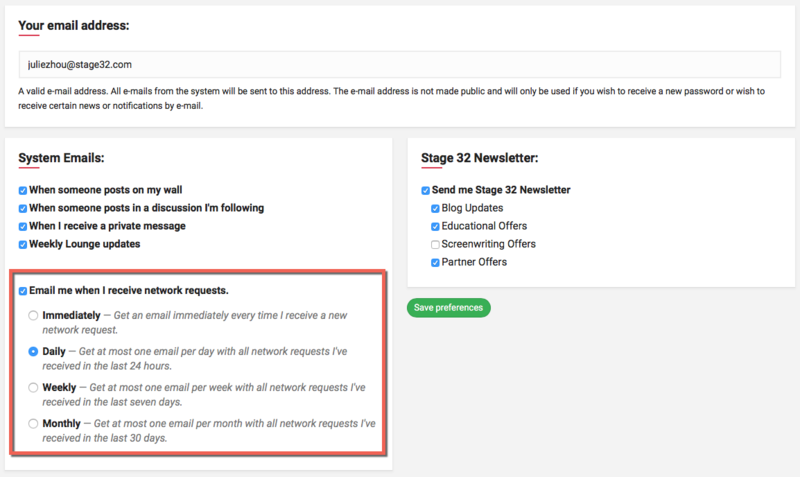 You can set your network request notification preference by following steps. - Click on your 'Email Preferences' button in the settings. - Check your prefer settings. - Finally, click on 'Save preference' to save all the changes. How to prevent search engines from crawling my page? To prevent search engines such as Google, Yahoo or AOL to cache (save) the information from your profile page, you can update your privacy settings here. Note that you must be logged in to perform this action. Could I reorder my occupation? Yes. You can start to edit on your background details page. Click on 'Add background details' add and reorder your occupation in the occupation field. Can I upload send images over private messages? Of course, you can click on the image icon in the text editor to upload any image that you want share with your friends. Could I add a photo to my logline? Definitely. You can upload a photo by clicking on "add a photo" button on the right. If you don't have a poster for the movie planned out and need creative ideas, try the free resources over at Canva. First, go to your videos page. From this page, click the dropdown button from the video you'd like to edit or remove. Posting work to your Stage 32 Reel is a great way to show off your talent. Get started today! To upload a new video, click Browse >> Video on the top menu. On the Upload page you have 3 options. Post a link, upload a file from your device, or return to the previous page. On the Polst a link page. Just cut and past the link you of the video you want to upload and click Submit. 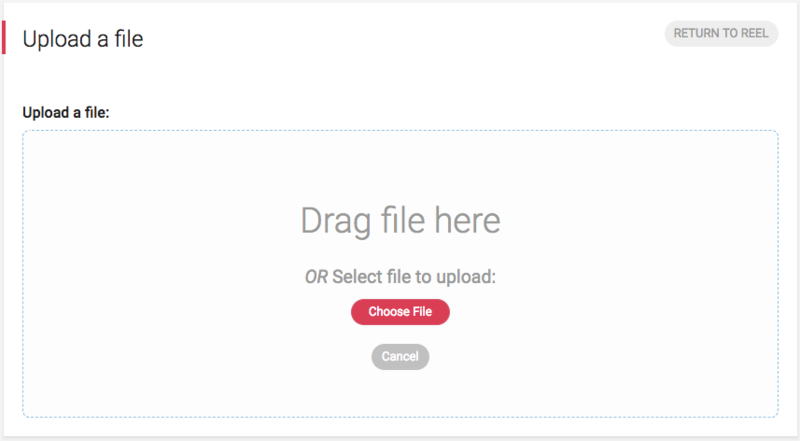 On the Upload a file page, you can either browse for your file by clicking Choose File or just drag and drop the video file directly into the gray box. Your video will start uploading automatically. You'll be able to see the video upload progress in real time. Once your video is done uploading, enter a title and description then click Save. 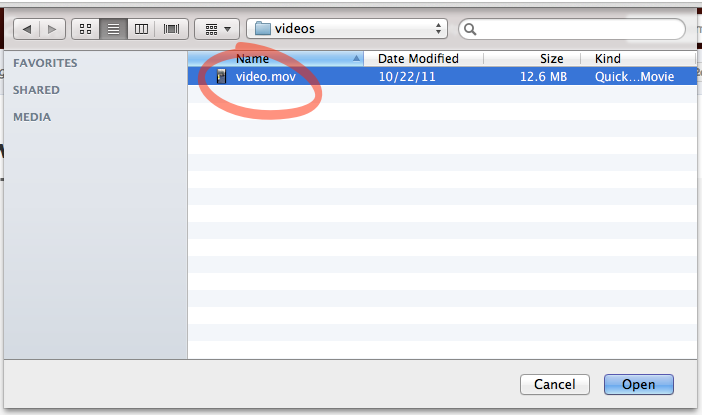 Please note: Depending on the size of your video, it may take up to an hour for us to process it. Usually, it'll be ready in less than 5 minutes. To return to your Reel, click Done. 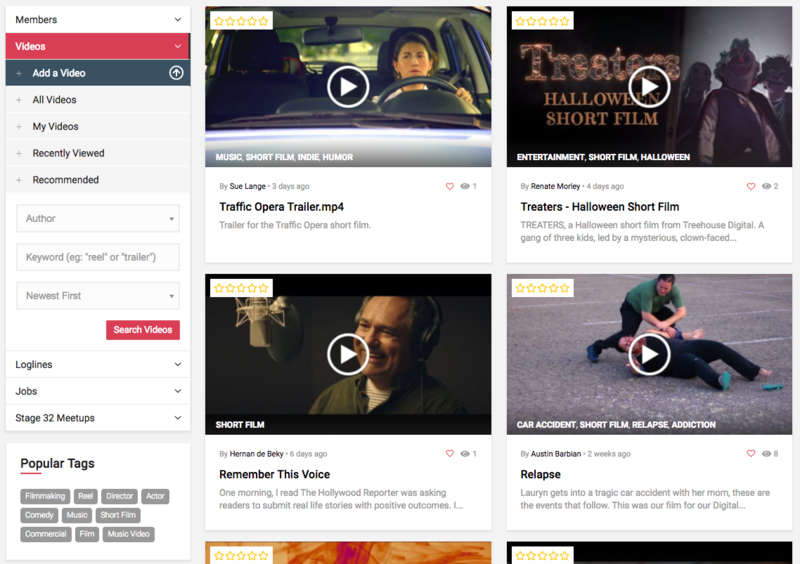 Posting videos to your Stage 32 Reel is a great way to show off your work and promote yourself. Check out the new and improved video upload system today! Linking your Stage 32 profile to your personal website or blog is the perfect way to up your exposure. 2. Copy the code provided for your selected profile button. Adding your résumé or CV to your Stage 32 profile is easy. You can even add multiple résumés/CVs if needed. Click your account menu (upper right corner of the page) and select Edit profile. At the bottom of the Résumé / CV section, select Upload your résumé / CV. Select Choose File or Browse and select a file from your computer to upload. Optionally, enter a description for the uploaded file. This is useful if your résumé or CV contains many separate documents. To add more documents, just click Add another and repeat steps 3 and 4. When you are done uploading your document(s), click Save changes. At the bottom of the Résumé / CV section, select Edit. Click the X button next to the uploaded résumé / CV you'd like to remove. Click Save changes to confirm removal of your uploaded document(s). 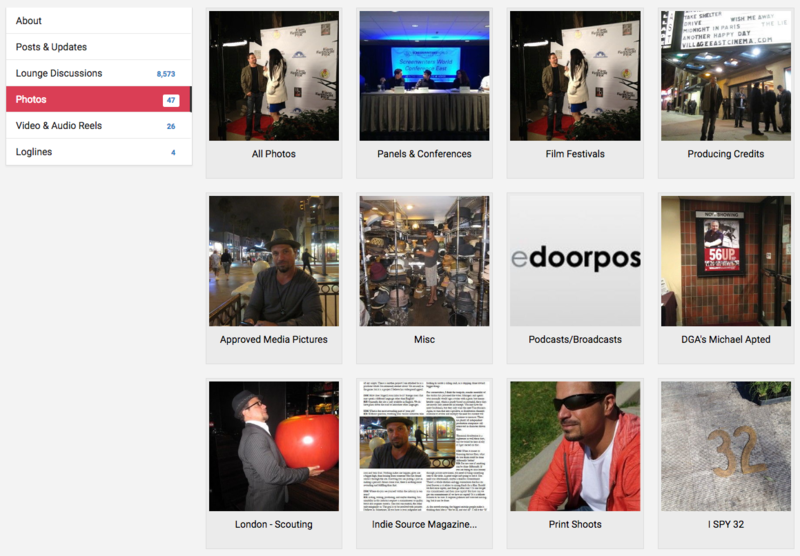 You can group your photos into albums within your "Photos" page. 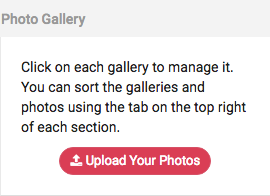 When you upload photos to Stage 32, all photos will go to your photo gallery under "Profile" > "Photos" and will show up on your wall and in your updates. 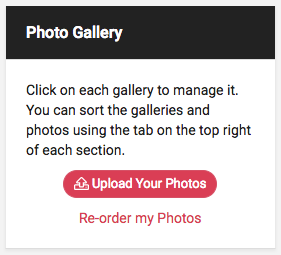 You can get to the photo uploading section from three different places. Note: If you upload multiple photos within 1 hour, these photos will be grouped into a single update. Easiest way to manage your photos is to go into a specific photo album and clicking either the edit or delete button. Delete button will remove your photo and give you a chance to undo that action, while edit button will let you change photo's caption and album. Is the content of your caption too long to fit into two rows of text? No worries, we will show whatever fits and show an ellipsis (...) indicating that there is more to see. Anybody who clicks on that photo will be able to see the entire caption. Here is where you keep track of all the discussions you are personally involved in, all in one easy place for you to find! Similar to IMDB, here is where you make yourself shine. You can fill out your bio, location, Resume/CV, Education, Credits, Awards and links. Remember, be thorough! You only get one shot at a first impression! VIdeo/Audio - Reels, Shorts, Films, Audio Clips, etc. A logline is a one (or occasionally two) sentence description that boils the script down to its essential dramatic narrative in as succinct a manner as possible. A tagline is a piece of marketing copy designed to go on posters to sell the film. Can I reorder my loglines? Yes. While on your loglines page, you can click the "Re-order my loglines" link. This will toggle a sorting functionality. At that point, you'll be able to click and drag the loglines and change their order by moving them up or down. I can't see the day and time my logline was added. We believe that most loglines, synopses and screenplays are timeless. Some of the masterpieces haven't seen the light of day for years since their creation. We encourage you not to put dates on your virtual loglines, but if you chose to do so, you may annotate it with a comment stating the date and time it was created. What are Desert Island Movies? "Desert Island Movies" is a fun extension to your profile. Add up to 10 movies to you profile and use the dragging icon on the left to rank them putting your most favorite movies on top. They are also great ice breakers. You can see the favorite films other members picked out by visiting their profiles. Where can I find / edit Desert Island Movies? Simply click "Edit" to add or modify your selection. 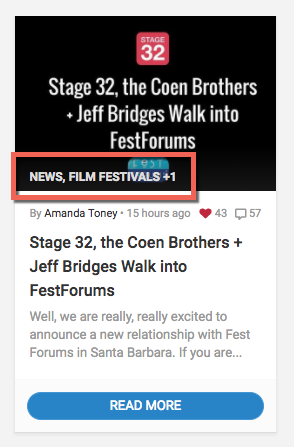 See what movies you have in common with other Stage 32 members, and don't miss the right arrow on the side of the panel. If the member has more than five movies chosen, you will have to use that arrow to view all of their picks. Can I reorder my Desert Island Movies? 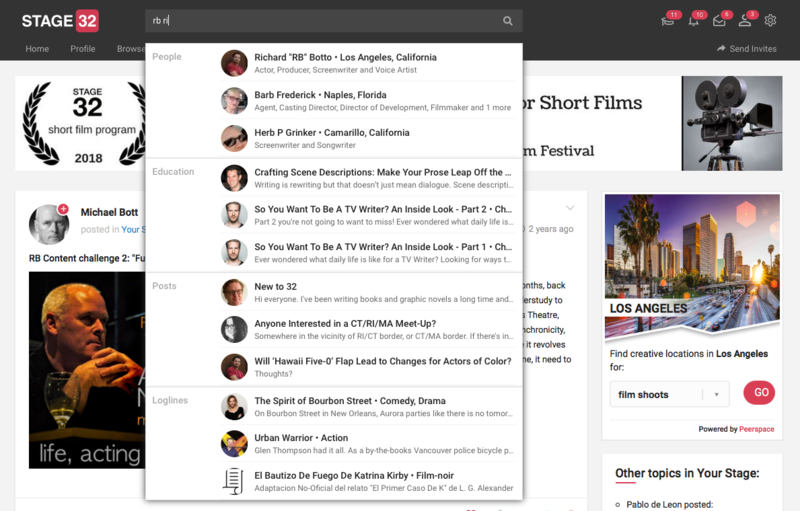 Go to your profile, click "Edit" and select "Edit social links"
List your IMDb profile and your Film Freeway profile here. Make sure to use the suggested format. Click "Save changes" when done. Scroll down to your "Projects" section and click "Import" link. Make sure your links are correct and click "Get my Projects"
Your projects will be listed here. If something feels wrong, you can cancel, otherwise, click "Import my data". Once the information is populated, it may take few minutes for your account to get updated. If you experience longer than usual delays, please let us know. If you already have an IMDb profile, you can quickly import your IMDb credits to your Stage 32 profile. 1. Select Edit profile from your Account settings menu in the upper right corner of the screen. 2. In the Credits section of your profile, click Import from IMDb. 3. Type in or paste your full IMDb profile link and click Get my Credits. 5. We will automatically start the process of importing your IMDb credits. This may take a few minutes if you have a large number of credits to import. 6. After your credits have been imported, they will be displayed on your Stage 32 Profile page in reverse chronological order. You can edit or remove any of these credits just the same as credits that you added manually (by clicking the edit/remove credit link next to the credit you'd like to change). That's all there is to it! Get started importing your IMDb credits today! How can I auto-start my reel? First, copy the url (from the address bar) that links to your reel. Then, add ?autoplay=true to the end of this url. If you want to auto-start this reel at a specific time, you can add ?autoplay=true#t=s instead, where s is the number of seconds offset from the start of the reel. For example #t=10 will start 10 seconds into the video, #t=100 will start 1 minute and 40 seconds into the video. What are the Stage 32 pitch sessions? If you have a script or reel (for select sessions only) that you feel is ready to be reviewed by industry professionals for consideration or representation, and you've prepared a professional pitch, Stage 32 provides you a unique way to pitch your screenplay directly to a variety of development executives, producers, managers or agents who are currently in the market looking for new material. Stage 32 has spent years cultivating relationships with over 300 executives worldwide who work with us to help them find undiscovered material that they normally wouldn't have access to. Writers who have pitched through our service have been signed, optioned, taken into production, put into development or staffed on TV shows as a result. You can read more here, or watch videos from our writers here, here or here. Live pitch sessions are done face-to-face directly with the executive through Skype and also by written submissions. For pitches, always start with the title, movies to compare it to (ie: "it's DIE HARD meets GOONIES! 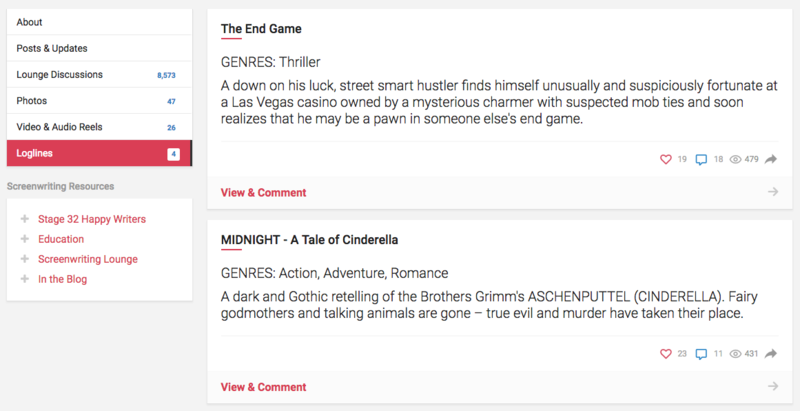 "), genre, and logline. Talk BRIEFLY about yourself and then dive into the story. Start by setting up the world this takes place in and then the protagonist (name, age, an actor that could play him/her, etc). Be sure to run through your story and character arcs in their entirety. Do not leave out the ending. For live sessions over Skype, you will have 8 minutes to pitch your material to the executive. We recommend keeping your pitch to 4-6 minutes to allow room for any questions the executive might have at the end. For written pitches, make sure your pitch is 1-2 pages max. These are industry-standard professional pitching sessions so we expect you to be fully prepared. If you have any further questions, please reach out to WriterHelp@Stage32.com for assistance. We offer two ways to pitch to an executive: one-on-one, face to face via Skype or by submitting a written pitch. To learn more, visit Pitch Sessions or Online Pitchfest. Can I include pictures or storyboards in my written pitch? Of course! Please keep in mind that the 2 page maximum for written pitches includes such material. Pictures/storyboards included, your written must must not exceed 2 pages. What if script gets produced as a result of pitching through your service? Will you get a percentage, credit, etc? No, we will have no stake in the project once we pass it along. We just want to be thanked at your Oscar or Emmy speech! Has anyone had success with your Online Pitchfests and other pitch sessions? Over 200 writers have been signed, bought, optioned, or placed in the television or film workspace after utilizing our pitching and coverage services. You can read some of our Success Stories here. You can also read testimonials from our writers and our terrific executives here. Can I choose which executive I want to pitch to read my script or pitch my project to? Of course! For our Online Pitchfests, pitch sessions, coverage and consulting service YOU are the one to choose who will be reading your script, or reviewing your pitch. If you're not sure which executive is right for you, feel free to reach out to us at WriterHelp@Stage32.com. Feel free to reach out to us directly at WriterHelp@Stage32.com and we will assist you with whatever you need! The Stage 32 Happy Writers is here to help you every step of the way! What do I do after I sign up for a written pitch? After you sign up for a written pitch, you will receive an automated e-mail from us with complete instructions on how to submit your written pitch. Please be patient as you might not receive this email immediately after signing up. Be sure to check your spam and/or promotions folder. Please upload your written material as soon as possible. Do not wait until the start of the session. The absolute deadline to submit your material is 30 minutes before the scheduled start of the session. Failure to submit your material on time will result in a non-refundable forfeiture of your pitch. NO EXCEPTIONS. You do not have to be present at the time of the pitch session if you are turning in a written pitch. Simply turn in your pitch and you will hear from us in a minimum of 10 business days with your report. How do I submit a script to a Stage 32 Happy Writers screenplay contest? When you complete your purchase for a Stage 32 Happy Writers screenplay contest, you will be sent to a screen and prompted to upload your screenplay. ONLY .PDF FORMAT SCRIPTS ARE ACCEPTED. No .doc, .fdx, .celtix, etc. Can I participate in your live pitch sessions if I do not live in the US? Yes. You can be anywhere in the world to participate. If you want to do a verbal pitch then you must send in your Skype username, not an international phone number. What type of report will I get after my pitch session if I get passed on? Your report will include 2-6 sentences of feedback on how to better your pitch and/or story filled out directly by the executive you pitched to. The report will include a 1-5 grade on multiple categories and a "PASS" or "REQUEST". If you are requested, you will receive an email from us with further instructions on how to submit your screenplay. When will I hear if my script was requested? When will I hear back on my requested material once it is submitted? You will hear from a Stage 32 Happy Writers Coordinator 2-3 weeks after your session. Once your requested material has been submitted to us and sent to the executive, you will hear back from a Stage 32 Coordinator in 2-3 months after the executive has had a chance to review your material. You will also receive a Script Request Scorecard complete with feedback from the executive. Can I pitch a script that isn't completed yet? Your script must be completed in order to pitch with us. If you do get a request, you must turn in your script 72 hours after receiving the request email, otherwise you forfeit your right to submit your script to that executive and your pitch will not be refunded. Do you have pitch templates that can help mold my pitch? CLICK HERE TO DOWNLOAD THE STAGE 32 HAPPY WRITERS PITCHING TEMPLATE. Do I contact the executive directly at my designated time? No. You will be contacted by a Stage 32 Happy Writers Coordinator at the time of your pitch session if you are doing a verbal pitch. Do not call in on Skype as we have several sessions going on at once and it will disrupt other sessions. Please do not reach out to these executives on your own, as they do not accept unsolicited material. I submitted a pitch and got passed on. What should I do? Please know that this is just one person's opinion. Take the feedback constructively and graciously. Tweak the pitch with any notes that resonate. If you get more than 10 pass on your project, then you might want to consider getting coverage as there might be some story issues that are getting in the way. I got a request! Am I able to continue pitching it to other companies? Congratulations on your request! Yes. You can pitch it to other companies even if it was requested. You can pitch as much as you want until a company has agreed to move forward with it. If I got a request, can I submit more material than just the script (i.e. a business plan, a show bible, a series overview, a bio, etc.)? When getting a script request, please only submit the script. Ancillary material not specifically requested by the executive will not be sent. This includes query letters, cover letters, letters of interest, treatments, pictures, outlines, etc. ABSOLUTELY NO EXCEPTIONS. It is a good idea to include the list of your ancillary material in your pitch so the executive knows it is available to be requested. After I submit a written pitch or script to an executive and make changes after the fact, can I turn in revised material? Revised material may not be submitted. Please review all material thoroughly before submitting. Can I pitch more than one project in one session? It's better to keep the focus on each session to one project. Otherwise you will not be able to give each pitch their due diligence. If you would like to pitch more than one project in an 8 minute session or 2 page written pitch, then you must sign up for an additional slot. What's the difference between pitch sessions and Online Pitchfests? For our Online Pitchfests, you will be able to submit a logline that will be reviewed by all executives in attendance of the pitchfest. They will review your logline for consideration, after which they have option to request the script. I signed up for a pitch session for your Online PitchFest. How do I turn in my logline so it can be seen by all the executives? You will receive a link on how to turn in your logline. You must turn in your logline before the start of the entire Online PitchFest, not just before the start of your particular session. For example, if you signed up for a pitch on Sunday and the Online PitchFest starts on Saturday, then you need to turn in your logline on Saturday so the executives coming in that day can see your logline as well. I signed up for a pitch and missed my slot. Can I send in my pitch late? If you missed your slot you can not turn in your pitch late or have a make up session. By missing your slot you forfeit your opportunity to pitch to that executive and there will be no refund or credits. May I include a reel in my pitch? If you are signing up for a written pitch, please include a link to your reel in the written pitch. Make sure that if there is a password needed that you include that in your written pitch. Your reel should not exceed 4 minutes. If you are signing up for a verbal pitch, please send us your link to your reel. The executive will watch your reel before the start of your session and then contact you. We deduct the amount of time it took them to watch your reel from your 8 minute session. So if your reel is 5 minutes long, then your verbal session will be 3 minutes long. In both cases, make sure your reel is on a site such as Youtube or Vimeo. Do not send us a reel as an attachment to download. Can I pitch a book? Yes. You can pitch books as long as the genre matches what the executive is looking for. Please note at the top of your pitch that you are pitching a novel. What is better, a written or verbal pitch? What's the difference? We have seen success both ways. In our professional opinion and experience, the best verbal pitch trumps the best written pitch every time. However, it's really up to YOU and how you like to convey your story. Some writers feel more comfortable pitching their story verbally and some prefer to write down their thoughts and organize things that way. It depends on you and what you feel your strengths are. Verbal pitches are 8 minutes long and done face-to-face over skype or over telephone. We recommend keeping your pitch to 4-6 minutes to allow room for questions. Please note how you would like to be contacted. Even if you are opting for a Skype session, still provide your phone number and keep your phone near you at the time of your session in case we have to call you. International phone calls outside the United States will NOT be made. Please put the company you are pitching to in the email subject line. Written pitches are 2 pages max. Take care to format your document to make sure it is easy to read - do not submit a document that is just a block of text. Remember that a written pitch is, in essence, a miniature writing sample. By signing up to a written pitch you are agreeing that your pitch will be complete and ready to be submitted no later than 30 minutes before the scheduled start of the session. You will NOT be able to submit a written pitch after the pitch session has started. No exceptions. Your pitch must be 1-2 pages max. Written pitches exceeding the 2 page limit will not be read past the second page. 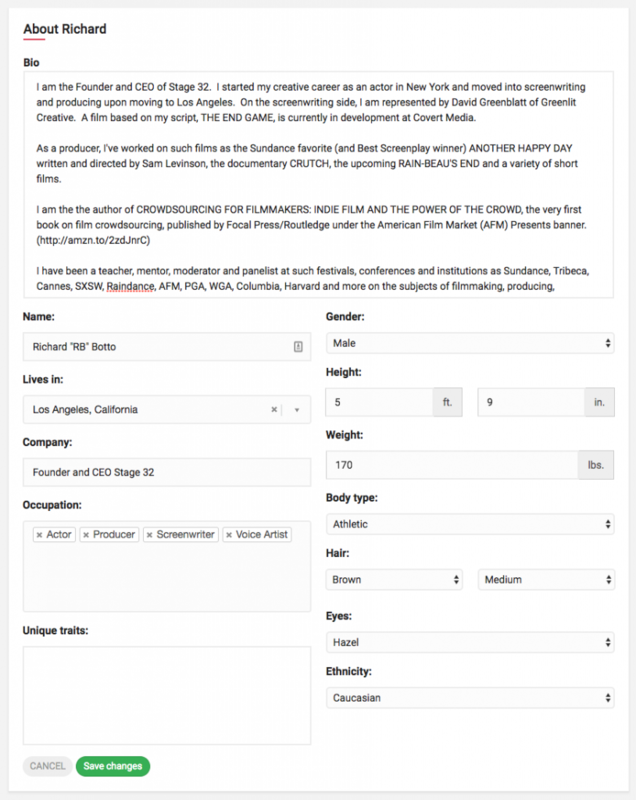 Your pitch MUST have your name, title of your script and email address in the upper right hand corner of the page. Failure to abide by these stated requirements may result in a non-refundable forfeiture of your pitch. After I sign up for coverage, when can I expect it returned to me? You will receive your completed coverage or consult 2-3 weeks after signing up and submitting your material. I have a script that I want covered but don't know who to pick. What should I do? Our executives are broken down in terms of the genre they feel the most comfortable critiquing. You can choose the executive you want based on your genre, or reach out to WriterHelp@Stage32.com for a recommendation. Please include your script's genre and logline so we can recommend the perfect executive for your project. I want to sign up for an executive, but when I click on the coverage or consult option, they don't show up. Some executives are only available for certain services. Some executives only want to give notes verbally and some only want to give notes in written form. If you sign up for a particular service and the executive you want doesn't show up, that means they are not part of that particular service. Does the Executive Mentoring Session come with a script read? Executive Mentoring Sessions do not come with a script read. You may submit ancillary material such as a written pitch or outline, so long as it does not exceed 20 pages. 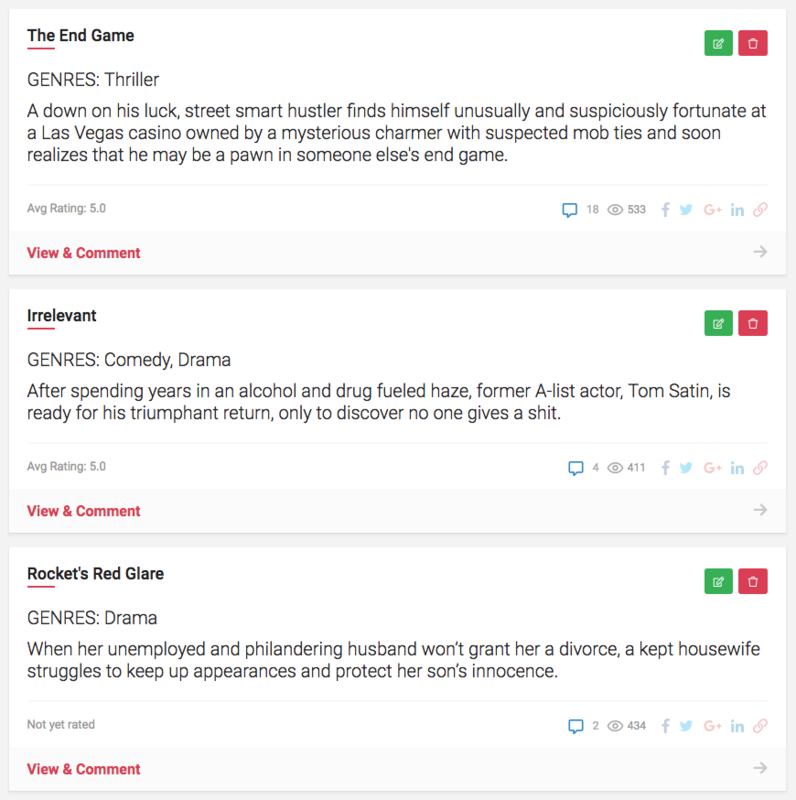 Where can I find the Stage 32 Happy Writers Pitching Template? You can find the pitching template under the "pitching tips" tab in every executive listing. Alternatively, you can click here to download the template. This will open up a popup with the link address - you can now copy it and paste it anywhere to share with others. As it's been said many times when it comes to the entertainment industry, it's not only what you know, but who you know. 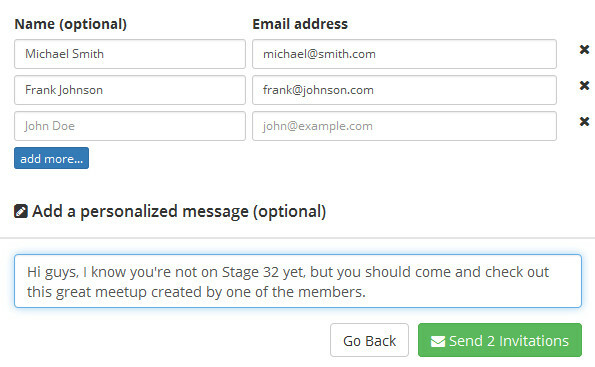 Now, sending a Stage 32 Network Request is as easy as one click. At the top of a member's profile, just click the blue Add to Network button. You can also click the blue Add button next to a Stage 32 Member Search result or on a member's wall or Lounge post. This button will also change to gray to confirm that your network request has been sent. If you find that you've sent a network request accidentally, it's easy to cancel your request. Just go to the member's profile page and click Cancel network request on their profile sidebar. You'll see a confirmation that your request has been canceled. Expanding your Stage 32 network is a great way to build connections in the community and keep up to date with your fellow creatives. Get started today! When you have pending network requests, you'll see a number next to the Requests link on your profile side bar. Click the Requests link to see all of your pending network requests. From your Pending network requests page, just click Accept on each network request you wish to accept. To remove a person from your network, go to their profile and hover with your mouse over the In Network button it will turn from green to red. Click the Remove from Network button to remove from network. Last, but certainly not least. Don't worry about sending the invite to somebody over and over again. We will prevent this from happening. If you already sent an invite to someone once, you'll be able to tell once the list is populated. How do I identify the meetup once I get to the address in question? This may be different case by case. Some people may print a banner from Stage 32 meetup page to identify the exact location. Others may use the green shaded note area on the meetup page to provide more information. If you feel that not enough information has been listed, you may write a comment on the meetup page, and the organizer will be informed that you requested more information. What are Stage 32 Meetup name badges? 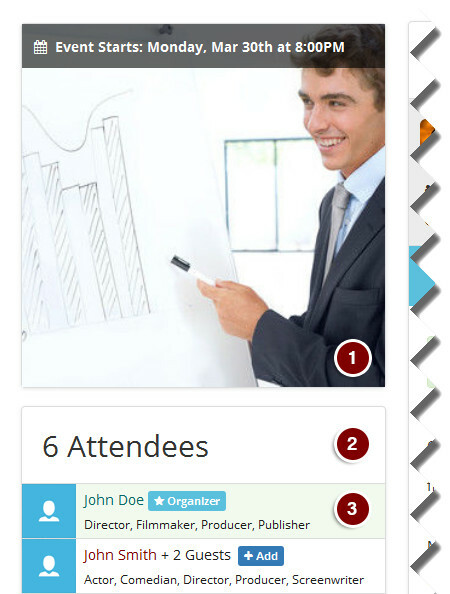 If you are organizing an event, you may go ahead and print out name badges for your attendees. It's always helpful in a larger crowd of people to identify the people you have not yet met. You may print name badges from each meetup page. We recommend that you print the information right before the event as some people may choose to register late. Can I look at the photos that were taken during a meetup? You may view all of the photos that were taken during a specific meetup by going to the meetup in question and clicking on any of the photo listed below the meetup description. This will start a gallery that will allow you to browse all of the photos taken during this meetup. Some select meetup photos will be listed in our Stage 32 Meetups Gallery - so feel free to go there and browse the photos of all the past meetups. Creating a meetup involves filling out a single simple form @ www.stage32.com/meetups/add. Enter the information about the location of the meetup along with date and time you would like the meetup to take place. Finally provide some information about the meetup, so that people can decide if it's for them or not. If you are planning to create more meetups in the future you may also create a group in this area as well. I got lost on the way to the meetup - how do I find it? Full location to the meetup is always available on the meetup page. You may go to the list of your meetups, and click on the meetup in question. Also on the same page, you will be able to finda a map (#2 on the screenshot below). Clicking on the map will take you to Google Maps for navigational instructions. Many times an important note may be added as how to enter the premises, or which entrance to take, or how to locate the group - such notes may be listed above the meetup information in green shaded area (#1 on the screenshot below). If such area is not visible on the page it simply means that the note had not been provided. 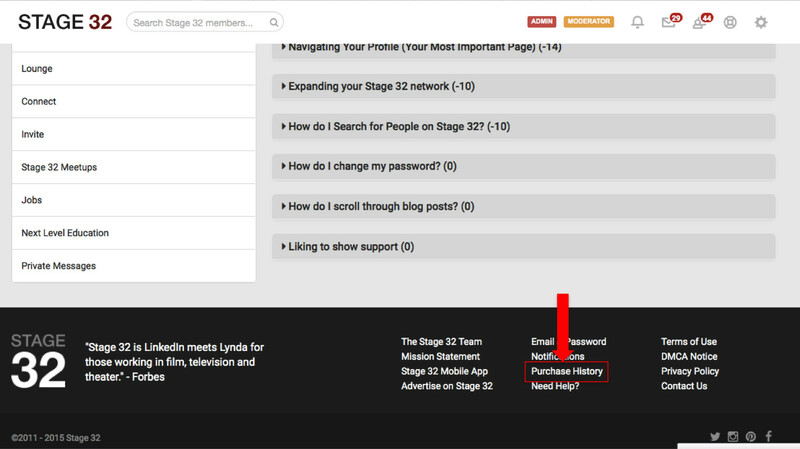 What are Stage 32 Meetup policies? "This section is not intended to publicize or promote your screening events, classes, products and so on. Meetups are purely intended for taking your Stage 32 networks "offline". Creative group meetups, networking events and parties without any bias of financial gain are all permitted. 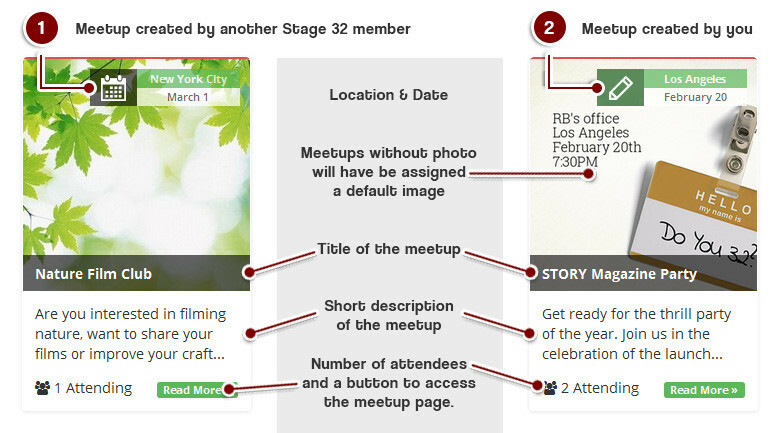 All meetups can be removed at the discretion of Stage 32. All individuals violating terms of this agreement will be permanently disallowed from creating any future meetups." Simply this states that meetups are intended to connect with other creatives in your area in order to exchange thoughts and ideas, and not to promote your business, product or project. 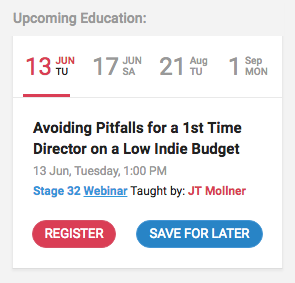 What is a cost of creating a meetup on Stage 32? Stage 32 Meetups may be created by any members of the site for free. Keep in mind that there are policies involved in creating a meetup - you will be asked to agree to the policies in question before creating a new event. If you choose to disregard the provided terms your meetup will be removed and your account will be blocked from creating future meetups. What is a Stage 32 Meetup Group? If you believe that the meetup you are creating will become a regular event, or will be targeted to a specific shared discipline (i.e. acting / screenwriting / filmmaking group), we recommend that you create a group with your meetup, however if you are planning to create a one time meetup (i.e. in a place you are traveling to), you may want to skip creating the group. Can I add a photo to an event that I attended? Yes. All attendees can add a photo to the meetup. Keep in mind that the event moderators or Stage 32 event moderators reserve the right to remove the photo at any time, but feel free to share as many photos as you want for each event. The photos will be listed in the event preview, and if accepted by Stage 32 team, in Meetups gallery. If the button is not blue, that means that the event has not yet begun. Can I remove an inappropriate photo on my meetup? Simply click on the X in the upper right corner and the image will be automatically removed. Can I share a meetup on Twitter or Facebook? You can click to like the event here on Stage 32, and you can share it either on Facebook, Twitter, Google Plus, Linkedin or simply forward the link to the page via email. Can I invite my friends to a Stage 32 meetup? 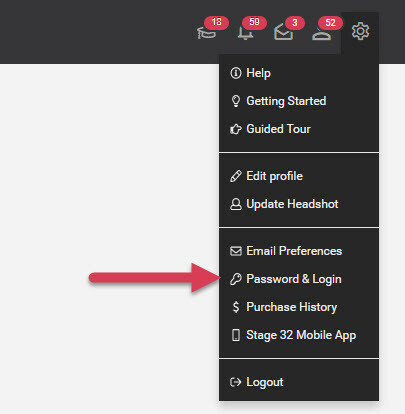 Whether you want to inivte your friends who are already on Stage 32 or those who have not yet created an account, you may do so by clicking "Invite your Friends" button (#3 on the screenshot below). 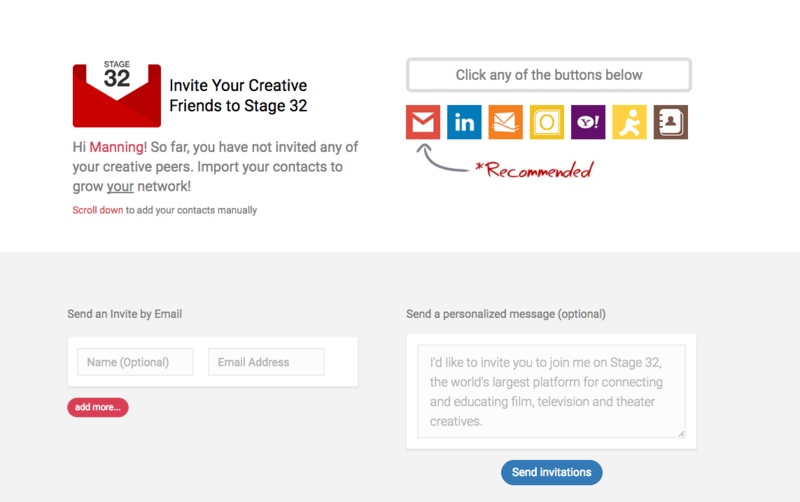 You will then see an option to either invite your friends from Stage 32 or invite other creative friends who do not yet have a Stage 32 account. 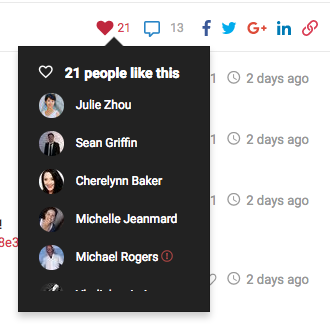 You can quickly toggle between "Skip" or "Invite" for each of the recommended members. You can also add your personalized message. When done, click "Send Invitations" and your friends will receive a link to the meetup in question. How can I tell when and where the meetup takes place? Not only you will see the full address here, you can also preview the map, click on the map to view it in the google maps, and add the event to your calendar. How do I find out who created the meetup? Meetups can be created either by individual Stage 32 members, or by groups. This example shows a meetup greated by a group named "This is the name of the group". You can see that the group has 2 active members and 1 active meetup. Finally, you can join the group to be informed of the upcoming events. If the meetup was created by an individual Stage 32 member, you will only see the information related to the individual in question. Can I cancel / change my meetup reservation? At any time, you can come back to the meetup and select "Change my Reservation" button. You can select to bring more or less guests and click "Confirm", or you may click "Cancel My Reservation" and you will be removed from the list. How do I join a meetup? 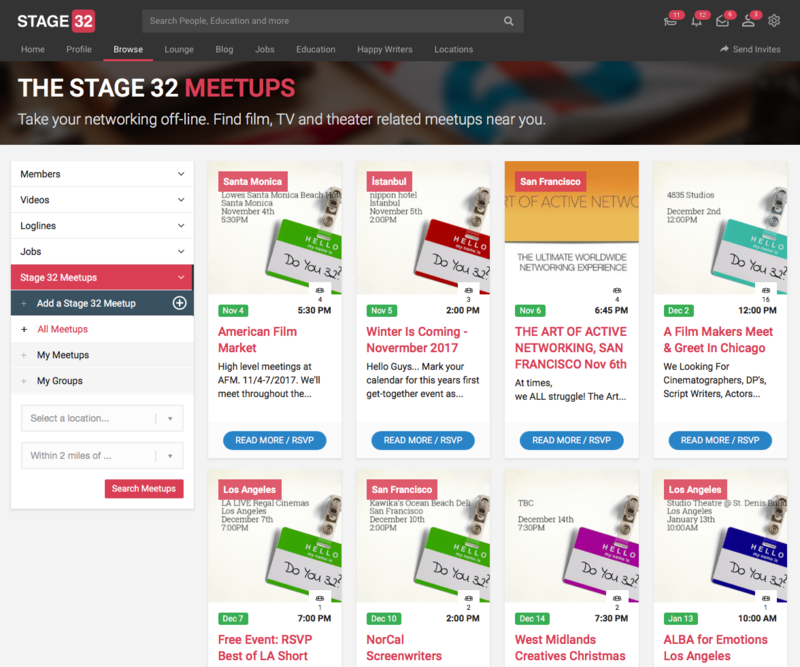 If you are a registered Stage 32 member, then joining a meetup could not be simpler. 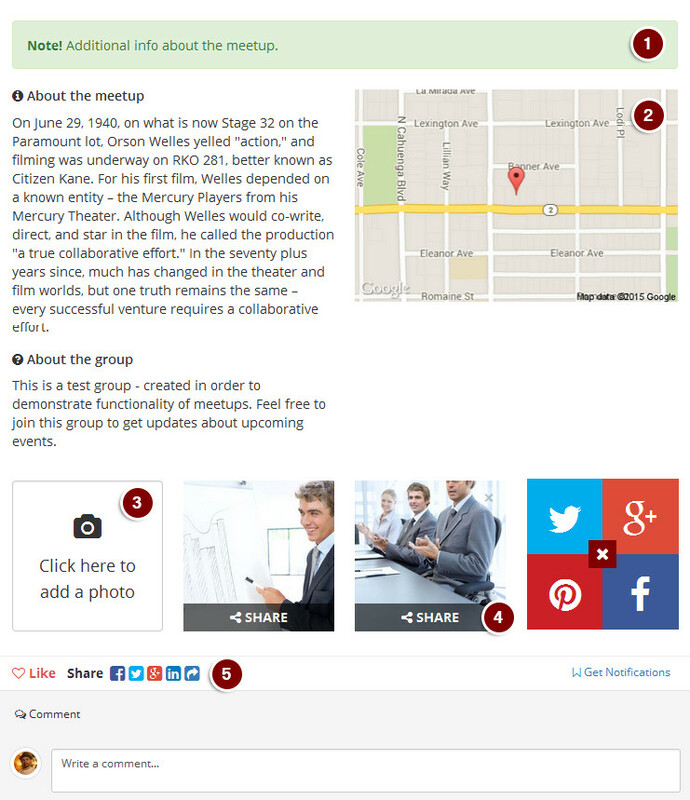 On a meetup page in question, click "Join this meetup" button (#4 on the screenshot below). You will be asked if you want to bring guests - if you are not bringing any guests, simply click "Confirm". If you are bringing one or two guests, please make your selection and click "Confirm". If you have changed your mind and cannot attend a meetup in question, you can cancel here as well by clicking "Cancel my Reservation"
Can I see the list of all attendees? You can see who is attending the meetup, you can connect with each attendee, or if you want to prepare for the meetup, you can even go to each of the attendee's personal profile and read their bio and research their credit. Being prepared means showing that you care. Also in this section you will see the main image used for the meetup (1), total number of attendees with their guests (2) and who is the organizer of the event (3). I see a lot of meetups listed, can you explain what I am looking at? All meetups are created by other Stage 32 members with the intentions of connecting with other creatives near you. Location and date - will be listed on top of the meetup photo to give you the most important details right away - when and where the meetup takes place. Status indicator - If you have created the meetup in question, you will see a green pen icon, which allows you to edit the meetup. If you have not created the meetup, you will either see a checkmark icon indicating that you have RSVP'd to the meetup, or a calendar icon indicating that you have not yet RSVP'd to the meetup in question. Meetup photo - if a photo is not yet available, you will see the name of the location printed above the city, date and time of the event. Meetup description - excerpt from the entire description will be available for preview on the page. Read more button - in the bottom right will take you to the meetup in question. Note that you can also click on the meetup title or the meetup image to read more about the meetup. How do I find a meetup in my city? 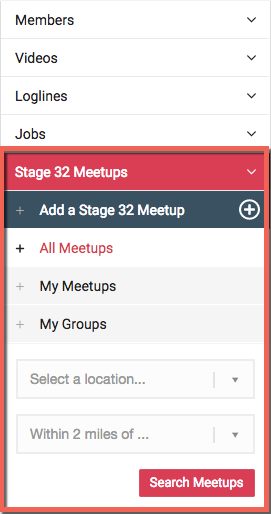 As soon as you click on the meetups tab in the menu, you will see the list of all the meetups (scheduled and past) by Stage 32 members. Go ahead and type in the city you are located in and click "Search". If any of the meetups are scheduled for the location entered, you will see the list populated below the search bar. If there are no meetups scheduled in that area, we recommend that you create one yourself and connect with other Stage 32 members that reside near you. Your last saved search will be your default. 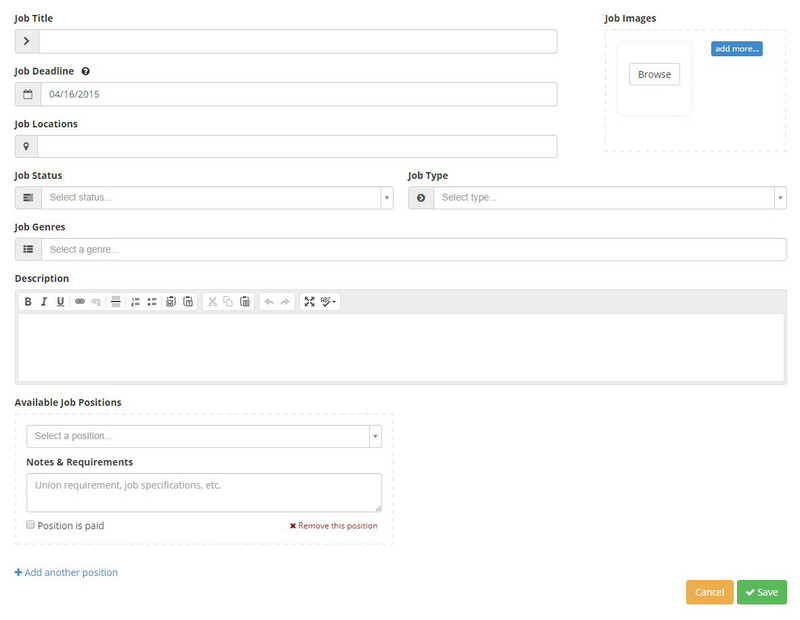 This means that each time you come back to the Jobs page, you will see the results for that search. 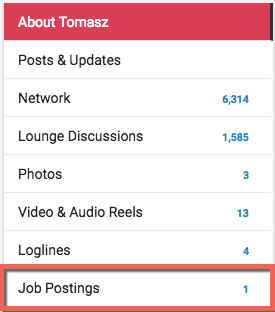 Also, if you go to your Home page (main menu), you will see a quick overview of the jobs in the right sidebar. Can I Search All Locations at Once? Absolutely. By default all locations are listed. If you select a location - another default is that you will be looking at 25 mile radius around the location. You can change that as well. If you want to return to searching all locations, simply click on the 'x'. I applied for a job. What's next? When you clicked apply, your message has been emailed to the job owner. You can check the status of your application by going to Your Job Applications. This means that the owner of the job has not yet selected an applicant. This means that the owner chose you for the position that you applied for. Congrats! This means that the owner either cancelled the position or hired somebody else. You can always keep checking the status of your application for updates, but don't worry about missing out on your accepted applications. If the job owner decides to hire you, we will send you a message letting you know that you've been hired. Job posts are displayed differently depending on whether you are a job seeker or a job owner. If you are seeking work, you will be able to save the job for later viewing, you will see how many positions are available and the status of the project. If you are offering work, you will be able to go directly to the job edit page, and see at one glance how many positions are left and how many applicants are awaiting your decision. There are five (5) sub-sections to the Jobs page. First three are used by applicants for searching, applying and saving jobs. The last two are mainly for use by those who are currently seeking cast, crew and personnel. To get started, click Find work at the top of the page. The Find work page will automatically show you projects in your area based on the Current city and Occupations you’ve added to your profile. You can search for work in other locations or for different occupations by changing the search criteria on the left side of the page. The Seeking field allows you to select which occupations to search for. To add more occupations, just click Select occupations… to see a list of options. To search the list, just start typing the name of an occupation. Click an occupation name to add it. To remove an occupation from your search, click the X next to an occupation name. After you’ve selected the location and occupations you’d like to search, just click the Search button. To see more details about a project, click the project’s title to be taken to that project’s page. Whether your a camera operator in Vancouver, a music composer in London, or an actor in Chicago, Stage 32’s new Find work section will connect you with projects in your area looking for creatives your specific skillset. Go to the Jobs section (main menu) and click on "Add a Job Posting"
Complete the form with details of your project and click Save. 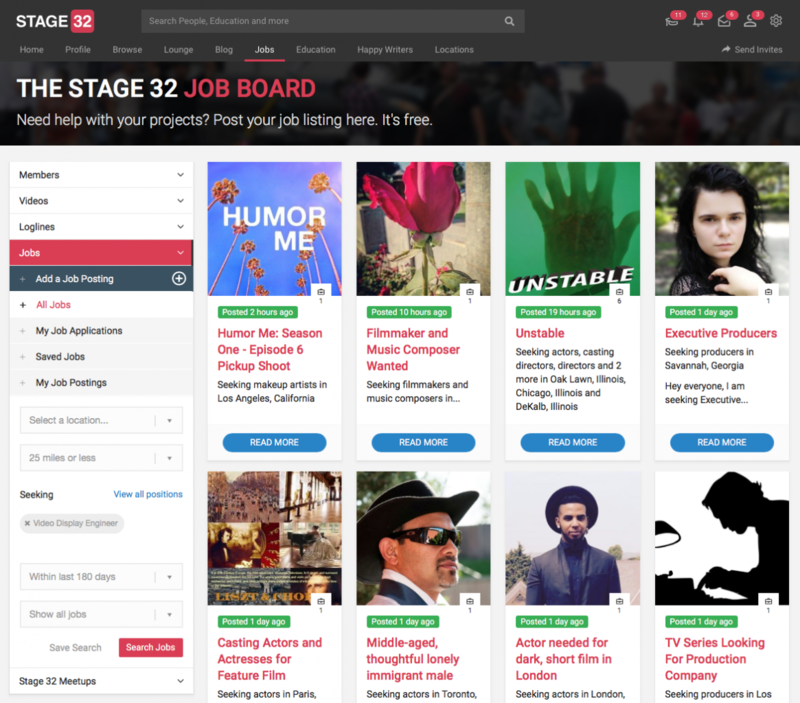 Your project will be immediately available for Stage 32 members to see in the Find Work section. Next Level Webinars - Our Next Level Webinars are live online seminars and are jam-packed with information. Our webinars run a minimum of 90-minutes (although many of our instructors tend to go much longer) and include an interactive question and answer session. 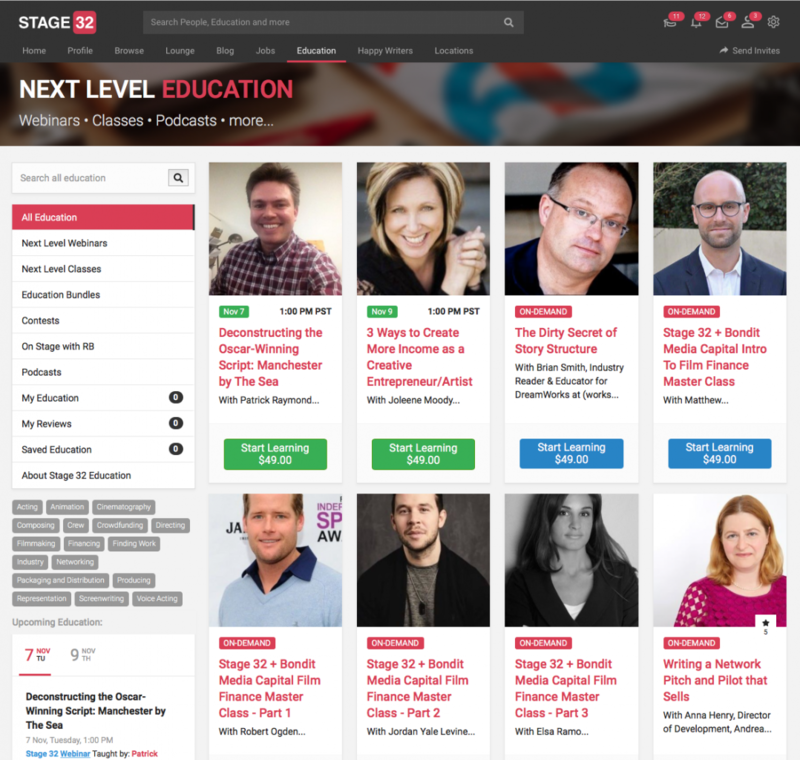 Next Level Classes – Next Level Classes are longer, live courses formatted in a college lecture hall style. Most classes run about 2 hours and are fully interactive, covering a 2 to 6 week period. Although these are live classes, if you cannot make a class, that’s no problem. All classes are made available On-Demand within a day or so of completion. From time to time, we offer 8-week Next Level Labs. Our labs are limited to 20 people and include one-on-one time with the instructor. On-Demand Next Level Webinars and Classes – All of our Next Level Education (with the exception of labs) is available for purchase On-Demand at any time, and can be viewed immediately. Much like when attending a live event, when you purchase On-Demand Next Level Education, you have unlimited access to the material for a full year! On Stage With RB – Since 2013, our CEO, RB, takes to the stage every month for a 3-hour webcast designed to educate and entertain. Besides interviewing industry insiders, RB also offers tips on how to best use Stage 32 and takes questions from the Stage 32 community. 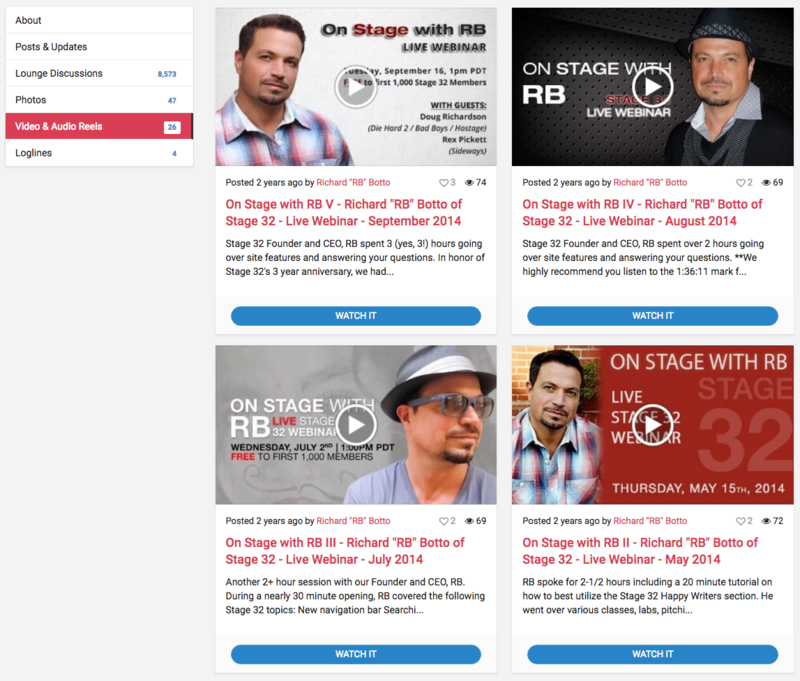 All On Stage With RB webcasts are completely FREE and can be viewed as often as desired. Podcasts – RB has also been a guest on a variety of podcasts and webcasts offering industry insights, tips and education. You can listen and view them here for FREE and as often as you like. My Education - How do I access my webinar, class or lab? Have you purchased a webinar, class or a lab recently and would like to gain access to it? - there are 3 ways to get there. 1) Clicking "My Education" tab under the "Education" section from the top menu bar will take you directly to the list of your education related purchases. You will see a link to watch the webinar or the class again, review and rate the webinar or the class and review the payment information. 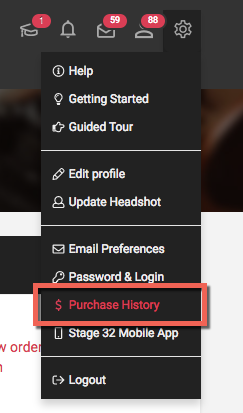 2) Clicking "Purchase History" under "Settings" from your top menu bar will take you to "My Education"
3) Click "Purchase History" link in the footer of every page to view the list of all of your purchases. 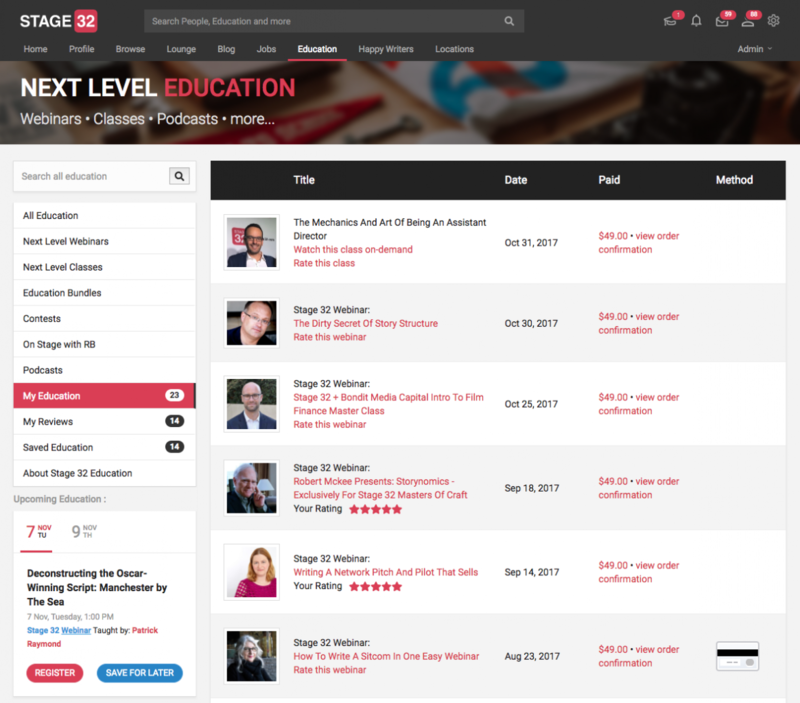 This is section within Next Level Education that lists the webinars, classes or labs that you've shown interest in and saved. Once on this page, you can click on each item to learn more. 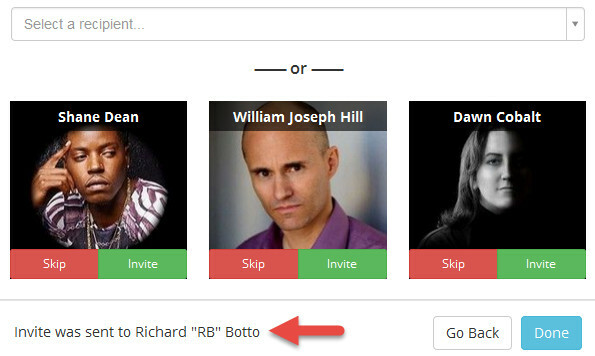 On Stage With RB is a monthly online broadcast hosted by our Founder & CEO, Richard "RB" Botto. Each broadcast is FREE and open to the first 2,000 members who register. During the broadcast RB has on special industry guests and answers questions exclusively for Stage 32 members. You can participate no matter where you live in the world! Click on "Education" then "On Stage With RB." Our Founder & CEO, Richard Botto, has been on numerous podcasts, all educational and informational about the industry and Stage 32. This education is FREE. Enjoy! How could I find or browse a webinar? You can easily find your webinar by typing into the keywords in the search field . If you want to browse the upcoming events, they are also listed under education calendar which is to the left side of the education page. 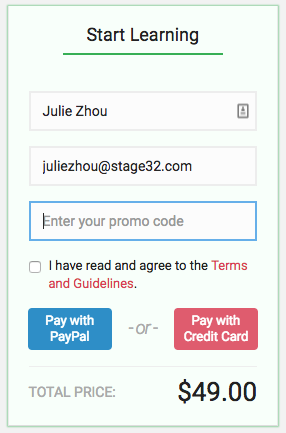 On every webinar and class page you will find an input field that states "Enter your promo code" - enter the code and choose your payment option to continue to checkout. You will instantly see that the code has been applied. To get started, click the Messages link from your profile sidebar. On the left side of the Messages page, you'll see buttons to allow you to select Unread, All, or Sent messages. Unread messages will be shown by default. You'll also be able to see the number of messages in each of these groups. Below the buttons, you'll see a list of messages in the group you've selected. Click a message in the list to read it. To reply to a message, just type your reply below the last message and click Send. The message group counts will also be updated automatically. To mark a message as unread, click the eye icon. To delete a conversation, click the trash can icon and confirm that you want the conversation to be deleted. How could I send private messages? You can send private messages to other members by following steps. First, please select a recipient from you network. 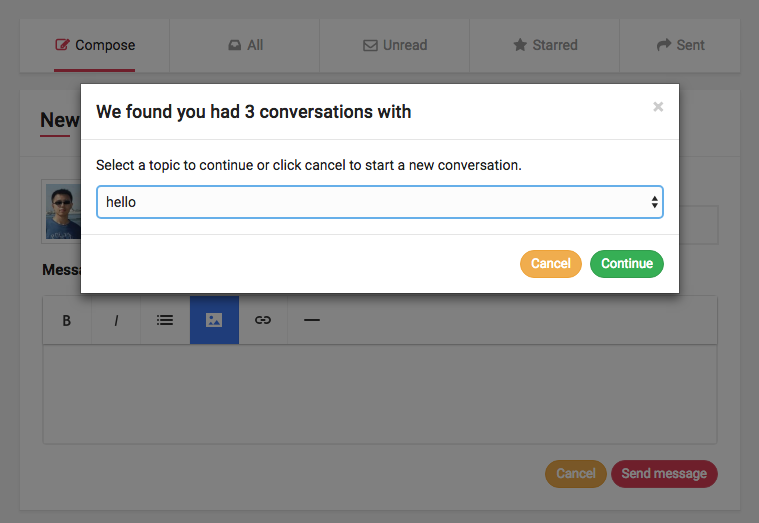 If you have a previous conversation with this member, you will see a popup box asking whether you want to continue the conversation or start with a new one. For safety reason, we don't suggest your sharing personal information with the people you don't know. The Stage 32 Writers’ Room is an exclusive community of writers who gather weekly online for inspiring and educational webcasts designed to help those serious about a life and career in the industry. Each week, industry executives and our writing team will provide you with a wide variety of actionable information designed to not only improve your writing, but help you navigate this increasingly complicated business. If you can’t make it live, don’t worry! We’ll record each week’s session so you can stay up to date. What If I Can't Attend a Webcast Live? No problem! ALL webcasts will be placed in the Writers' Room Vault. You can watch the On Demand recordings whenever and as many times as you'd like! Webcasts will be held every Wednesday at 4PM PST, unless noted otherwise (ie. holiday conflict). How Will I Access the Webcasts? You will receive an email with an access link each week for the week's webcast.